"Gorbachev" redirects here. For other people with the surname, see Gorbachev (surname). This name uses Eastern Slavic naming customs; the patronymic is Sergeyevich and the family name is Gorbachev. Mikhail Sergeyevich Gorbachev[a] (born 2 March 1931) is a Russian and formerly Soviet politician. The eighth and last leader of the Soviet Union, he was General Secretary of its governing Communist Party from 1985 until 1991. He was the country's head of state from 1988 until 1991, serving as Chairman of the Presidium of the Supreme Soviet from 1988 to 1989, Chairman of the Supreme Soviet from 1989 to 1990, and President of the Soviet Union from 1990 to 1991. Ideologically, he initially adhered to Marxism-Leninism although by the early 1990s had moved toward social democracy. Of mixed Russian and Ukrainian heritage, Gorbachev was born in Privolnoye, Stavropol Krai to a poor peasant family. Growing up under the rule of Joseph Stalin, in his youth he operated combine harvesters on a collective farm before joining the Communist Party, which then governed the Soviet Union as a one-party state according to Marxist-Leninist doctrine. While studying at Moscow State University, he married fellow student Raisa Titarenko in 1953 prior to receiving his law degree in 1955. Moving to Stavropol, he worked for the Komsomol youth organisation and, after Stalin's death, became a keen proponent of the de-Stalinization reforms of Soviet leader Nikita Khrushchev. He was appointed the First Party Secretary of the Stavropol Regional Committee in 1970, in which position he oversaw construction of the Great Stavropol Canal. In 1978 he moved to Moscow to become a Secretary of the Central Committee and in 1979 became a candidate member of the party's governing Politburo. Within three years of the death of Soviet leader Leonid Brezhnev, following the brief regimes of Yuri Andropov and Konstantin Chernenko, the Politburo elected Gorbachev as General Secretary, the de facto head of government, in 1985. 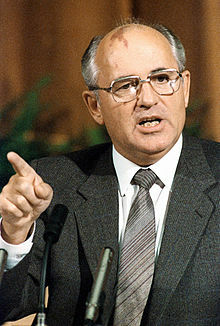 Although committed to preserving the Soviet state and to its socialist ideals, Gorbachev believed significant reform was necessary, particularly after the 1986 Chernobyl disaster. He withdrew from the Soviet–Afghan War and embarked on summits with United States President Ronald Reagan to limit nuclear weapons and end the Cold War. Domestically, his policy of glasnost ("openness") allowed for enhanced freedom of speech and press, while his perestroika ("restructuring") sought to decentralise economic decision making to improve efficiency. His democratisation measures and formation of the elected Congress of People's Deputies undermined the one-party state. Gorbachev declined to intervene militarily when various Eastern Bloc countries abandoned Marxist-Leninist governance in 1989-90. Internally, growing nationalist sentiment threatened to break-up the Soviet Union, leading Marxist-Leninist hardliners to launch an unsuccessful August 1991 coup against Gorbachev; in the wake of this, the Soviet Union dissolved and he resigned in December. Out of office, he launched his Gorbachev Foundation, became a vocal critic of Russian Presidents Boris Yeltsin and Vladimir Putin, and campaigned for Russia's social-democratic movement. Widely considered one of the most significant figures of the second half of the 20th century, Gorbachev remains the subject of controversy. The recipient of a wide range of awards—including the Nobel Peace Prize—he was widely praised for his pivotal role in ending the Cold War, curtailing human rights abuses in the Soviet Union, and tolerating both the fall of Marxist–Leninist administrations in eastern and central Europe and the reunification of Germany. Conversely, in Russia he is often derided for not stopping the Soviet collapse, an event which brought a decline in Russia's global influence and precipitated economic crisis. Gorbachev was born on 2 March 1931 in the village of Privolnoye, Stavropol Krai, then in the Russian Soviet Federative Socialist Republic, one of the constituent republics of the Soviet Union. At the time, Privolnoye was divided almost evenly between ethnic Russians and ethnic Ukrainians. Gorbachev's paternal family were ethnic Russians and had moved to the region from Voronezh several generations before; his maternal family were of ethnic Ukrainian heritage and had migrated from Chernigov. His parents named him Victor, but at the insistence of his mother—a devout Orthodox Christian—he had a secret baptism, where his grandfather christened him Mikhail. His relationship with his father, Sergey Andreyevich Gorbachev, was close; his mother, Maria Panteleyevna Gorbacheva (née Gopkalo), was colder and punitive. His parents were poor, and lived as peasants. They had married as teenagers in 1928, and in keeping with local tradition had initially resided in Sergei's father's house, an adobe-walled hut, before a hut of their own could be built. The Soviet Union was a one-party state governed by the Communist Party, and during Gorbachev's childhood was under the leadership of Joseph Stalin. Stalin had initiated a project of mass rural collectivisation which, in keeping with his Marxist-Leninist ideas, he believed would help convert the country into a socialist society. 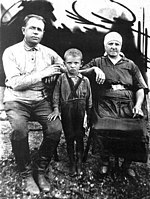 Gorbachev's maternal grandfather joined the Communist Party and helped form the village's first kolkhoz (collective farm) in 1929, becoming its chair. This farm was twelve miles outside Privolnoye village and when he was three years old, Gorbachev left his parental home and moved into the kolkhoz with his maternal grandparents. The country was then experiencing the famine of 1932–33, in which two of Gorbachev's paternal uncles and an aunt died. This was followed by the Great Purge, in which individuals accused of being "enemies of the people"—including those sympathetic to rival interpretations of Marxism like Trotskyism—were arrested and interned in labour camps, if not executed. Both of Gorbachev's grandfathers were arrested—his maternal in 1934 and his paternal in 1937—and both spent time in Gulag labour camps prior to being released. After his December 1938 release, Gorbachev's maternal grandfather discussed having been tortured by the secret police, an account that influenced the young boy. Following on from the outbreak of the Second World War in 1939, in June 1941 the German Army invaded the Soviet Union. German forces occupied Privolnoe for four and a half months in 1942. Gorbachev's father had joined the Soviet Red Army and fought on the frontlines; he was wrongly declared dead during the conflict and fought in the Battle of Kursk before returning to his family, injured. After Germany was defeated, Gorbachev's parents had their second son, Aleksandr, in 1947; he and Mikhail would be their only children. The village school had closed during much of the war but re-opened in autumn 1944. Gorbachev did not want to return but when he did he excelled academically. He read voraciously, moving from the Western novels of Thomas Mayne Reid to the work of Vissarion Belinsky, Alexander Pushkin, Nikolai Gogol, and Mikhail Lermontov. In 1946, he joined Komsomol, the Soviet political youth organisation, becoming leader of his local group and then being elected to the Komsomol committee for the district. From primary school he moved to the high school in Molotovskeye; he stayed there during the week while walking the twelve miles home during weekends. As well as being a member of the school's drama society, he organised sporting and social activities and led the school's morning exercise class. Over the course of five consecutive summers from 1946 onward he returned home to assist his father operate a combine harvester, during which they sometimes worked 20-hour days. In 1948, they harvested over 8000 centners of grain, a feat for which Sergey was awarded the Order of Lenin and his son the Order of the Red Banner of Labour. I would consider it a high honor to be a member of the highly advanced, genuinely revolutionary Communist party of Bolsheviks. I promise to be faithful to the great cause of Lenin and Stalin, to devote my entire life to the party's struggle for Communism. In June 1950, Gorbachev became a candidate member of the Communist Party. He also applied to study at the law school of Moscow State University (MSU), then the most prestigious university in the country. They accepted without asking for an exam, likely because of his worker-peasant origins and his possession of the Order of the Red Banner of Labour. His choice of law was unusual; it was not a well-regarded subject in Soviet society at that time. Aged 19, he travelled by train to Moscow, the first time he had left his home region. In the city, he resided with fellow MSU students at a dormitory in Sokolniki District. He and other rural students felt at odds with their Muscovite counterparts but he soon came to fit in. Fellow students recall him working especially hard, often late into the night. He gained a reputation as a mediator during disputes, and was also known for being outspoken in class, although would only reveal a number of his views privately; for instance he confided in some students his opposition to the Soviet jurisprudential norm that a confession proved guilt, noting that confessions could have been forced. During his studies, an anti-semitic campaign spread through the Soviet Union, culminating in the Doctors' plot; Gorbachev publicly defended a Jewish student who was accused of disloyalty to the country by one of their fellows. At MSU, he became the Komsomol head of his entering class, and then Komsomol's deputy secretary for agitation and propaganda at the law school. One of his first Komsomol assignments in Moscow was to monitor the election polling in Krasnopresnenskaya district to ensure the government's desire for near total turnout; Gorbachev found that most of those who voted did so "out of fear". In 1952, he was appointed a full member of the Communist Party. As a party and Komsomol member he was tasked with monitoring fellow students for potential subversion; some of his fellow students said that he did so only minimally and that they trusted him to keep confidential information secret from the authorities. Gorbachev became close friends with Zdeněk Mlynář, a Czechoslovak student who later became a primary ideologist of the 1968 Prague Spring. Mlynář recalled that the duo remained committed Marxist-Leninists despite their growing concerns about the Stalinist system. After Stalin died in March 1953, Gorbachev and Mlynář joined the crowds amassing to see Stalin's body laying in state. At MSU, Gorbachev met Raisa Titarenko, a Ukrainian studying in the university's philosophy department. She was engaged to another man but after that engagement fell apart, she began a relationship with Gorbachev; together they went to bookstores, museums, and art exhibits. In early 1953, he took an internship at the procurator's office in Molotovskoye district, but was angered by the incompetence and arrogance of those working there. That summer, he returned to Privolnoe to work with his father on the harvest; the money earned allowed him to pay for a wedding. On 25 September 1953 he and Raisa registered their marriage at Sokolniki Registry Office; and in October moved in together at the Lenin Hills dormitory. Raisa fell pregnant and although the couple wanted to keep the child she fell ill and required a life-saving abortion. In June 1955, Gorbachev graduated with a distinction; his final paper had been on the advantages of "socialist democracy" (the Soviet political system) over "bourgeois democracy" (liberal democracy). He was subsequently assigned to the Soviet Procurator's office, which was then focusing on the rehabilitation of the innocent victims of Stalin's purges, but found that they had no work for him. He was then offered a place on an MSU graduate course specialising in kolkhoz law, but declined. He had wanted to remain in Moscow, where Raisa was enrolled on a PhD program, but instead gained employment in Stavropol; Raisa abandoned her studies to join him there. In August 1955, Gorbachev started work at the Stavropol regional procurator's office, but disliked the job and used his contacts to get a transfer to work for Komsomol, becoming deputy director of Komosomol's agitation and propaganda department for that region. In this position, he visited villages in the area and tried to improve the lives of their inhabitants; he established a discussion circle in Gorkaya Balka village to help its peasant residents gain social contacts. Gorbachev and his wife initially rented a small room in Stavropol, taking daily evening walks around the city and on weekends hiking in the countryside. In January 1957, Raisa gave birth to a daughter, Irina, and in 1958 they moved into two rooms in a communal apartment. In 1961, Gorbachev pursued a second degree, on agricultural production; he took a correspondence course from the local Stavropol Agricultural Institute, receiving his diploma in 1967. His wife had also pursued a second degree, attaining a PhD in sociology in 1967 from the Moscow Pedagogical Institute; while in Stavropol she too joined the Communist Party. 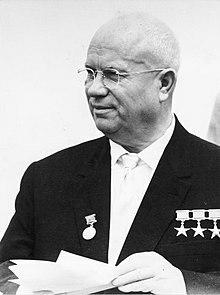 Stalin was ultimately succeeded as Soviet leader by Nikita Khrushchev, who denounced Stalin and his cult of personality in a speech given in February 1956, after which he launched a de-Stalinization process throughout Soviet society. Later biographer William Taubman suggested that Gorbachev "embodied" the "reformist spirit" of the Khrushchev era. Gorbachev was among those who saw themselves as "genuine Marxists" or "genuine Leninists" in contrast to what they regarded as the perversions of Stalin. He helped spread Khrushchev's anti-Stalinist message in Stavropol, but encountered many who continued to regard Stalin as a hero or who praised the Stalinist purges as just. Gorbachev rose steadily through the ranks of the local administration. The authorities regarded him as politically reliable, and he would flatter his superiors, for instance gaining favour with prominent local politician Fyodor Kulakov. With an ability to outmanoeuvre rivals, some colleagues resented his success. In September 1956, he was promoted First Secretary of the Stavropol city's Komsomol, placing him in charge of it; in April 1958 he was made deputy head of the Komsomol for the entire region. At this point he was given better accommodation: a two-room flat with its own private kitchen, toilet, and bathroom. In Stavropol, he formed a discussion club for youths, and helped mobilise local young people to take part in Khrushchev's agricultural and development campaigns. In March 1961, Gorbachev became First Secretary of the regional Komosomol, in which position he went out of his way to appoint women as city and district leaders. In 1961, Gorbachev played host to the Italian delegation for the World Youth Festival in Moscow; that October, he also attended the 22nd Congress of the Communist Party of the Soviet Union. 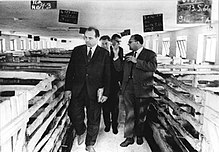 In January 1963, Gorbachev was promoted to personnel chief for the regional party's agricultural committee, and in September 1966 became First Secretary of the Stavropol City Party Organisation ("Gorkom"). By 1968 he was increasingly frustrated with his job—in large part because Khrushchev's reforms were stalling or being reversed—and he contemplated leaving politics to work in academia. However, in August 1968, he was named Second Secretary of the Stavropol Kraikom, making him the deputy of First Secretary Leonid Yefremov and the second most senior figure in the Stavrapol region. In 1969 he was elected as a deputy to the Supreme Soviet of the Soviet Union and made a member of its Standing Commission for the Protection of the Environment. Cleared for travel to Eastern Bloc countries, in 1966 he was part of a delegation visiting East Germany, and in 1969 and 1974 visited Bulgaria. In August 1968 the Soviet Union led an invasion of Czechoslovakia to put an end to the Prague Spring, a period of political liberalisation in the Marxist–Leninist country. Although Gorbachev later stated that he had had private concerns about the invasion, he publicly supported it. In September 1969 he was part of a Soviet delegation sent to Czechoslovakia, where he found the Czechoslovak people largely unwelcoming to them. That year, the Soviet authorities ordered him to punish Fagien B. Sadykov, a Stavropol-based agronomist whose ideas were regarded as critical of Soviet agricultural policy; Gorbachev ensured that Sadykov was fired from teaching but ignored calls for him to face tougher punishment. Gorbachev later related that he was "deeply affected" by the incident; "my conscience tormented me" for overseeing Sadykov's persecution. In April 1970, Yefremov was promoted to a higher position in Moscow and Gorbachev succeeded him as the First Secretary of the Stavropol kraikom. This granted Gorbachev significant power over the Stavropol region. He had been personally vetted for the position by senior Kremlin leaders and was informed of their decision by the Soviet leader, Leonid Brezhnev. Aged 39, he was considerably younger than his predecessors in the position. As head of the Stavropol region, he automatically became a member of the Central Committee of the Communist Party of the Soviet Union in 1971. According to biographer Zhores Medvedev, Gorbachev "had now joined the Party's super-elite". As regional leader, Gorbachev initially attributed economic and other failures to "the inefficiency and incompetence of cadres, flaws in management structure or gaps in legislation", but eventually concluded that they were caused by an excessive centralisation of decision making in Moscow. He began reading translations of restricted texts by Western Marxist authors like Antonio Gramsci, Louis Aragon, Roger Garaudy, and Giuseppe Boffa, and came under their influence. Gorbachev's main task as regional leader was to raise agricultural production levels, something hampered by severe droughts in 1975 and 1976. He oversaw the expansion of irrigation systems through construction of the Great Stavropol Canal. For overseeing a record grain harvest in Ipatovsky district, in March 1972 he was awarded by Order of the October Revolution by Brezhnev in a Moscow ceremony. Gorbachev always sought to maintain Brezhnev's trust; as regional leader, he repeatedly praised Brezhnev in his speeches, for instance referring to him as "the outstanding statesman of our time". Gorbachev and his wife holidayed in Moscow, Leningrad, Uzbekistan, and resorts in the North Caucusus; he holidayed with the head of the KGB, Yuri Andropov, who was favourable towards him and who became an important patron. Gorbachev also developed good relationships with senior figures like the Soviet Prime Minister, Alexei Kosygin, and the longstanding senior party member Mikhail Suslov. The government considered Gorbachev sufficiently reliable that he was sent as part of Soviet delegations to Western Europe; he made five trips there between 1970 and 1977. In September 1971 he was part of a delegation who travelled to Italy, where they met with representatives of the Italian Communist Party; Gorbachev loved Italian culture but was struck by the poverty and inequality he saw in the country. In 1972 he visited Belgium and the Netherlands and in 1973 West Germany. Gorbachev and his wife visited France in 1976 and 1977, on the latter occasion touring the country with a guide from the French Communist Party. He was surprised by how openly West Europeans offered their opinions and criticised their political leaders, something absent from the Soviet Union, where most people did not feel safe speaking so openly. He later related that for him and his wife, these visits "shook our a priori belief in the superiority of socialist over bourgeois democracy". Gorbachev had remained close to his parents; after his father became terminally ill in 1974, Gorbachev travelled to be with him in Privolnoe shortly before his death. His daughter, Irina, married fellow student Anatoly Virgansky in April 1978. In 1977, the Supreme Soviet appointed Gorbachev to chair the Standing Commission on Youth Affairs due to his experience with mobilising young people in Komsomol. In November 1978, Gorbachev was appointed a Secretary of the Central Committee. His appointment had been approved unanimously by the Central Committee's members. To fill this position, Gorbachev and his wife moved to Moscow, where they were initially given an old dacha outside the city. They then moved to another, at Sosnovka, before finally being allocated a newly built brick house. He was also given an apartment inside the city, but gave that to his daughter and son-in-law; Irina had begun work at Moscow's Second Medical Institute. As part of the Moscow political elite, Gorbachev and his wife now had access to better medical care and to specialised shops; they were also given cooks, servants, bodyguards, and secretaries, although many of these were spies for the KGB. In his new position, Gorbachev often worked twelve to sixteen hour days. He and his wife socialised little, but liked to visit Moscow's theatres and museums. In 1978, he was appointed to the Central Committee's Secretariat for Agriculture, replacing his old friend Kulakov, who had died of a heart attack. Gorbachev concentrated his attentions on agriculture: the harvests of 1979, 1980, and 1981 were all poor, due largely to weather conditions, and the country had to import increasing quantities of grain. He had growing concerns about the country's agricultural management system, coming to regard it as overly centralised and requiring more bottom-up decision making; he raised these points at his first speech at a Central Committee Plenum, given in July 1978. He began to have concerns about other policies too. 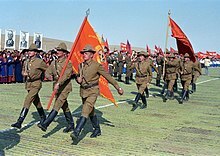 In December 1979, the Soviets sent the Red Army into neighbouring Afghanistan to support its Soviet-aligned government against Islamist insurgents; Gorbachev privately thought it a mistake. At times he openly supported the government position; in October 1980 he for instance endorsed Soviet calls for Poland's Marxist–Leninist government to crack down on growing internal dissent in that country. That same month, he was promoted from a candidate member to a full member of the Politburo, the highest decision-making authority in the Communist Party. At the time, he was the Politburo's youngest member. In April 1983, Gorbachev gave a speech marking the birthday of Lenin (pictured), founder of the Soviet state. After Brezhnev's death in November 1982, Andropov succeeded him as General Secretary of the Communist Party, the de facto head of government in the Soviet Union. Gorbachev was enthusiastic about the appointment. However, although Gorbachev hoped that Andropov would introduce liberalising reforms, the latter carried out only personnel shifts rather than structural change. Gorbachev became Andropov's closest ally in the Politburo; with Andropov's encouragement, Gorbachev sometimes chaired Politburo meetings. 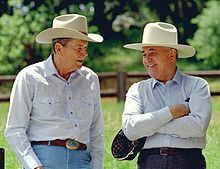 Andropov encouraged Gorbachev to expand into policy areas other than agriculture, preparing him for future higher office. In April 1983, Gorbachev delivered the annual speech marking the birthday of the Soviet founder Vladimir Lenin; this required him re-reading many of Lenin's later writings, in which the latter had called for reform, and encouraged Gorbachev's own conviction that reform was needed. In May 1983, Gorbachev was sent to Canada, where he met Prime Minister Pierre Trudeau and spoke to the Canadian Parliament. There, he met and befriended the Soviet ambassador, Aleksandr Yakovlev, who later became a key political ally. In February 1984, Andropov died; on his deathbed he indicated his desire that Gorbachev succeed him. Many in the Central Committee nevertheless thought the 53-year old Gorbachev was too young and inexperienced. Instead, Konstantin Chernenko—a longstanding Brezhnev ally—was appointed General Secretary, but he too was in very poor health. Chernenko was often too sick to chair Politburo meetings, with Gorbachev stepping in last minute. Gorbachev continued to cultivate allies both in the Kremlin and beyond, and also gave the main speech at a conference on Soviet ideology, where he angered party hardliners by implying that the country required reform. In April 1984, he was appointed chair of the Foreign Affairs Committee of the Soviet legislature, a largely honorific position. In June he travelled to Italy as a Soviet representative for the funeral of Italian Communist Party leader Enrico Berlinguer, and in September to Sofia, Bulgaria to attend celebrations of the fortieth anniversary of its liberation by the Red Army. In December, he visited Britain at the request of its Prime Minister Margaret Thatcher; she was aware that he was a potential reformer and wanted to meet him. At the end of the visit, Thatcher said: "I like Mr Gorbachev. We can do business together". He felt that the visit helped to erode Andrei Gromyko's dominance of Soviet foreign policy while at the same time sending a signal to the United States government that he wanted to improve Soviet-U.S. relations. On 10 March 1985, Chernenko died. Gromyko proposed Gorbachev as the next General Secretary; as a longstanding party member, Gromyko's recommendation carried great weight among the Central Committee. Gorbachev expected much opposition to his nomination as General Secretary, but ultimately the rest of the Politburo supported him. Shortly after Chernenko's death, the Politburo unanimously elected Gorbachev as his successor; they wanted him over another elderly leader. He thus became the eighth leader of the Soviet Union. Few in the government imagined that he would be as radical a reformer as he proved. Although not a well-known figure to the Soviet public, there was widespread relief that the new leader was not elderly and ailing. Gorbachev's first public appearance as leader was at Chernenko's Red Square funeral, held on 14 March. Two months after being elected, he left Moscow for the first time, traveling to Leningrad, where he spoke to assembled crowds. In June he travelled to Ukraine, in July to Belarus, and in September to Tyumen Oblast, urging party members in these areas to take more responsibility for fixing local problems. Gorbachev's leadership style differed from that of his predecessors. He would stop to talk to civilians on the street, forbade the display of his portrait at the 1985 Red Square holiday celebrations, and encouraged frank and open discussions at Politburo meetings. To the West, Gorbachev was seen as a more moderate and less threatening Soviet leader; some Western commentators however believed this an act to lull Western governments into a false sense of security. His wife was his closest adviser, and took on the unofficial role of a "first lady" by appearing with him on foreign trips; her public visibility was a breach of standard practice and generated resentment. His other close aides were Georgy Shakhnazarov and Anatoly Chernyaev. Gorbachev was aware that the Politburo could remove him from office, and that he could not pursue more radical reform without a majority of supporters in the Politburo. He sought to remove several older members from the Politburo, encouraging Grigory Romanov, Nikolai Tikhonov, and Viktor Grishin into retirement. He moved Gromyko from his role in foreign policy to that of head of state and replaced Gromyko's former role with his own ally, Eduard Shevardnadze. Other allies whom he saw promoted were Yakovlev, Anatoly Lukyanov, and Vadim Medvedev. Another of those promoted by Gorbachev was Boris Yeltsin, who was made a Secretary of the Central Committee in July 1985. Most of these appointees were from a new generation of well-educated officials who had been frustrated during the Brezhnev era. In his first year, 14 of the 23 heads of department in the secretariat were replaced. Doing so, Gorbachev secured dominance in the Politburo within a year, faster than either Stalin, Khrushchev, or Brezhnev had achieved. Gorbachev recurrently employed the term perestroika, first used publicly in March 1984. He saw perestroika as encompassing a complex series of reforms to restructure society and the economy. He was concerned by the country's low productivity, poor work ethic, and inferior quality goods; like several economists, he feared this would lead to the country becoming a second-rate power. The first stage of Gorbachev's perestroika was uskorenie ("acceleration"), a term he used regularly in the first two years of his leadership. The Soviet Union was behind the United States in many areas of production, but Gorbachev claimed that it would accelerate industrial output to match that of the U.S. by 2000. The Five Year Plan of 1985–90 was targeted to expand machine building by 50 to 100%. To boost agricultural productivity, he merged five ministries and a state committee into a single entity, Agroprom, although by late 1986 acknowledged this merger as a failure. The purpose of reform was to prop up the centrally planned economy—not to transition to market socialism. Speaking in late summer 1985 to the secretaries for economic affairs of the central committees of the East European communist parties, Gorbachev said: "Many of you see the solution to your problems in resorting to market mechanisms in place of direct planning. Some of you look at the market as a lifesaver for your economies. But, comrades, you should not think about lifesavers but about the ship, and the ship is socialism." Gorbachev's perestroika also entailed attempts to move away from technocratic management of the economy by increasingly involving the labour force in industrial production. He was of the view that once freed from the strong control of central planners, state-owned enterprises would act as market agents. Gorbachev and other Soviet leaders did not anticipate opposition to the perestroika reforms; according to their interpretation of Marxism, they believed that in a socialist society like the Soviet Union there would not be "antagonistic contradictions". However, there would come to be a public perception in the country that many bureaucrats were paying lip service to the reforms while trying to undermine them. He also initiated the concept of gospriyomka (state acceptance of production) during his time as leader, which represented quality control. In April 1986, he introduced an agrarian reform which linked salaries to output and allowed collective farms to sell 30% of their produce directly to shops or co-operatives rather than giving it all to the state for distribution. In a September 1986 speech, he embraced the idea of reintroducing market economics to the country alongside limited private enterprise, citing Lenin's New Economic Policy as a precedent; he nevertheless stressed that he did not regard this as a return to capitalism. In the Soviet Union, alcohol consumption had risen steadily between 1950 and 1985. By the 1980s, drunkenness was a major social problem and Andropov had planned a major campaign to limit alcohol consumption. Encouraged by his wife, Gorbachev—who believed the campaign would improve health and work efficiency—oversaw its implementation. Alcohol production was reduced by around 40 percent, the legal drinking age rose from 18 to 21, alcohol prices were increased, stores were banned from selling it before 2pm, and tougher penalties were introduced for workplace or public drunkenness and home production of alcohol. The All-Union Voluntary Society for the Struggle for Temperance was formed to promote sobriety; it had over 14 million members within three years. As a result, crime rates fell and life expectancy grew slightly between 1986 and 1987. However, moonshine production rose considerably, and the reform had significant costs to the Soviet economy, resulting in losses of up to US$100 billion between 1985 and 1990. Gorbachev later considered the campaign to have been an error, and it was terminated in October 1988. After it ended, it took several years for production to return to previous levels, after which alcohol consumption soared in Russia between 1990 and 1993. At the 27th Party Congress in February-March 1986, Gorbachev faced both hardliners who disliked his reforms and liberalisers (like Yeltsin) who thought they did not go far enough. In the second year of his leadership, Gorbachev began speaking of glasnost, or "openness". According to Doder and Branston, this meant "greater openness and candour in government affairs and for an interplay of different and sometimes conflicting views in political debates, in the press, and in Soviet culture." Encouraging reformers into prominent media positions, he brought in Sergei Zalygin as head of Novy Mir magazine and Yegor Yakovlev as editor-in-chief of Moscow News. He made the historian Yuri Afanasiev dean of the State Historical Archive Faculty, from where Afansiev could press for the opening of secret archives and the reassessment of Soviet history. Prominent dissidents like Andrei Sakharov were freed from internal exile or prison. Gorbachev saw glasnost as a necessary measure to ensure perestroika by alerting the Soviet populace to the nature of the country's problems in the hope that they would support his efforts to fix them. Particularly popular among the Soviet intelligentsia, who became key Gorbachev supporters, glasnost boosted his domestic popularity but alarmed many Communist Party hardliners. For many Soviet citizens, this newfound level of freedom of speech and press—and its accompanying revelations about the country's past—was uncomfortable. Some in the party thought Gorbachev was not going far enough in his reforms; a prominent liberal critic was Yeltsin. He had risen rapidly since 1985, attaining the role of Moscow city boss. Like many members of the government, Gorbachev was sceptical of Yeltsin, believing that he engaged in too much self-promotion. Yeltsin was also critical of Gorbachev, regarding him as patronising. In early 1986, Yeltsin began sniping at Gorbachev in Politburo meetings. At the Twenty-Seventh Party Congress in February, Yeltsin called for more far-reaching reforms than Gorbachev was initiating and criticised the party leadership, although did not cite Gorbachev by name, claiming that a new cult of personality was forming. Gorbachev then opened the floor to responses, after which attendees publicly criticised Yeltsin for several hours. After this, Gorbachev also criticised Yeltsin, claiming that he only cared for himself and was "politically illiterate". Yeltsin then resigned as both Moscow boss and as a member of the Politburo. From this point, tensions between the two men developed into a mutual hatred. In April 1986 the Chernobyl disaster occurred. In the immediate aftermath, officials fed Gorbachev incorrect information to downplay the incident. As the scale of the disaster became apparent, 336,000 people were evacuated from the area around Chernobyl. Taubman noted that the disaster marked "a turning point for Gorbachev and the Soviet regime". Several days after it occurred, he gave a televised report to the nation. He cited the disaster as evidence for what he regarded as widespread problems in Soviet society, such as shoddy workmanship and workplace inertia. Gorbachev later described the incident as one which made him appreciate the scale of incompetence and cover-ups in the Soviet Union. From April to the end of the year, Gorbachev became increasingly open in his criticism of the Soviet system, including food production, state bureaucracy, the military draft, and the large size of the prison population. In a May 1985 speech given to the Soviet Foreign Ministry—the first time a Soviet leader had directly addressed his country's diplomats—Gorbachev spoke of a "radical restructuring" of foreign policy. A major issue facing his leadership was Soviet involvement in the Afghan Civil War, which had then been going on for over five years. Over the course of the war, 13,000 Soviet soldiers would be killed and there was much opposition to Soviet involvement among both the public and military. On becoming leader, Gorbachev saw withdrawal from the war as a key priority. In October 1985, he met with Afghan Marxist leader Babrak Karmal, urging him to acknowledge the lack of widespread public support for his government and pursue a power sharing agreement with the opposition. That month, the Politburo approved Gorbachev's decision to withdraw combat troops from Afghanistan, although the last troops did not leave until February 1989. Gorbachev had inherited a renewed period of high tension in the Cold War. He believed strongly in the need to sharply improve relations with the United States; he was appalled at the prospect of nuclear war, was aware that the Soviet Union was unlikely to win the arms race, and thought that the continued focus on high military spending was detrimental to his desire for domestic reform. Although privately also appalled at the prospect of nuclear war, U.S. President Ronald Reagan publicly appeared to not want a de-escalation of tensions, having scrapped détente and arms controls, initiating a military build-up, and calling the Soviet Union the "evil empire". Both Gorbachev and Reagan wanted a summit to discuss the Cold War, but each faced some opposition to such a move within their respective governments. They agreed to hold a summit in Geneva, Switzerland in November 1985. In the build up to this, Gorbachev sought to improve relations with the U.S.' NATO allies, visiting France in October 1985 to meet with President François Mitterrand. At the Geneva summit, discussions between Gorbachev and Reagan were sometimes heated, and Gorbachev was initially frustrated that his U.S. counterpart "does not seem to hear what I am trying to say". As well as discussing the Cold War proxy conflicts in Afghanistan and Nicaragua and human rights issues, the pair discussed the U.S.' Strategic Defense Initiative (SDI), to which Gorbachev was strongly opposed. The duo's wives also met and spent time together at the summit. The summit ended with a joint commitment to avoiding nuclear war and to meet for two further summits: in Washington D.C. in 1986 and in Moscow in 1987. Following the conference, Gorbachev travelled to Prague to inform other Warsaw Pact leaders of developments. Gorbachev with Erich Honecker of East Germany. Privately, Gorbachev told Chernaev that Honecker was a "scumbag". In January 1986, Gorbachev publicly proposed a three-stage program for abolishing the world's nuclear weapons by the end of the 20th century. An agreement was then reached to meet with Reagan at Reykjavík, Iceland in October. Gorbachev wanted to secure guarantees that SDI would not be implemented, and in return was willing to offer concessions, including a 50% reduction in Soviet long range nuclear missiles. Both leaders agreed with the shared goal of abolishing nuclear weapons, but Reagan refused to terminate the SDI program and no deal was reached. After the summit, many of Reagan's allies criticised him for going along with the idea of abolishing nuclear weapons. Gorbachev meanwhile told the Politburo that Reagan was "extraordinarily primitive, troglodyte, and intellectually feeble". In his relations with the developing world, Gorbachev found many of the leaders professing revolutionary socialist credentials or a pro-Soviet attitude—such as Libya's Muammar Gaddafi and Syria's Hafez al-Assad—frustrating, and his best personal relationship was instead with India's Prime Minister, Rajiv Gandhi. He thought that the "socialist camp" of Marxist-Leninist governed states—the Eastern Bloc countries, North Korea, Vietnam, and Cuba—were a drain on the Soviet economy, receiving a far greater amount of goods from the Soviet Union than they collectively gave in return. He sought improved relations with China, a country whose Marxist government had severed ties with the Soviets in the Sino-Soviet Split. In June 1985 he signed a US$14 billion five-year trade agreement with the country and in July 1986, he proposed troop reductions along the Soviet-Chinese border, hailing China as "a great socialist country". He made clear his desire for Soviet membership of the Asian Development Bank and for greater ties to Pacific countries, especially China and Japan. In January 1987, Gorbachev attended a Central Committee plenum where he talked about perestroika and democratisation while criticising widespread corruption. He considered putting a proposal to allow multi-party elections into his speech, but decided against doing so. After the plenum, he focused his attentions on economic reform, holding discussions with government officials and economists. Many economists proposed reducing ministerial controls on the economy and allowing state-owned enterprises to set their own targets; Ryzhkov and other government figures were sceptical. In June, Gorbachev finished his report on economic reform. It reflected a compromise: ministers would retain the ability to set output targets but these would not be considered binding. That month, a plenum accepted his recommendations and the Supreme Soviet passed a "law on enterprises" implementing the changes. Economic problems remained: by the late 1980s there were still widespread shortages of basic goods, rising inflation, and declining living standards. These stoked a number of miners' strikes in 1989. By 1987, the ethos of glasnost had spread through Soviet society: journalists were writing increasingly openly, many economic problems were being publicly revealed, and studies appeared that critically reassessed Soviet history. Gorbachev was broadly supportive, describing glasnost as "the crucial, irreplaceable weapon of perestroika". He nevertheless insisted that people should use the newfound freedom responsibly, stating that journalists and writers should avoid "sensationalism" and be "completely objective" in their reporting. Nearly two hundred previously restricted Soviet films were publicly released, and a range of Western films were also made available. In 1989, Soviet culpability for the 1940 Katyn massacre was finally revealed. In September 1987, the government stopped jamming the signal of the British Broadcasting Corporation and Voice of America. The reforms also included greater tolerance of religion; an Easter service was broadcast on Soviet television for the first time and the millennium celebrations of the Russian Orthodox Church were given media attention. Independent organisations appeared, most supportive of Gorbachev, although the largest, Pamyat, was ultra-nationalist and anti-Semitic in nature. Gorbachev also announced that Soviet Jews wishing to migrate to Israel would be allowed to do so, something previously prohibited. In August 1987, he holidayed in Nizhniaia Oreanda, Ukraine, there writing Perestroika: New Thinking for Our Country and Our World at the suggestion of U.S. publishers. For the 70th anniversary of the October Revolution of 1917—which brought Lenin and the Communist Party to power—Gorbachev produced a speech on "October and Perestroika: The Revolution Continues". Delivered to a ceremonial joint session of the Central Committee and the Supreme Soviet in the Kremlin Palace of Congresses, it praised Lenin but criticised Stalin for overseeing mass human rights abuses. Party hardliners thought the speech went too far; liberalisers thought it did not go far enough. In March 1988, the magazine Sovetskaya Rossiya published an open letter by the teacher Nina Andreyeva. It criticised elements of Gorbachev's reforms, attacking what she regarded as the denigration of the Stalinist era and arguing that a reformer clique—whom she implied were mostly Jews and ethnic minorities—were to blame. Over 900 Soviet newspapers reprinted it and anti-reformists rallied around it; many reformers panicked, fearing a backlash against perestroika. On returning from Yugoslavia, Gorbachev called a Politburo meeting to discuss the letter, at which he confronted those hardliners supporting its sentiment. Ultimately, the Politburo arrived at a unanimous decision to express disapproval of Andreyeva's letter and publish a rebuttal in Pravda. Yakovlev and Gorbachev's rebuttal claimed that those who "look everywhere for internal enemies" were "not patriots" and presented Stalin's "guilt for massive repressions and lawlessness" as "enormous and unforgiveable". Although the 19th Party Conference was not scheduled until 1991, Gorbachev brought it forward to June 1988. He hoped that by allowing a broader range of people to attend than at previous conferences, he would gain additional support for his reforms. With sympathetic officials and academics, Gorbachev drafted plans for reforms that would shift power away from the Politburo and towards the soviets. While the soviets had become largely powerless bodies that rubber-stamped Politburo policies, he wanted them to become year-round legislatures. He proposed the formation of a new institution, the Congress of People's Deputies, whose members were to be elected in a largely free vote. This Congress would in turn elect a USSR Supreme Soviet, which would do most of the legislating. He also proposed that term limits be introduced for senior leaders. These proposals reflected Gorbachev's desire for more democracy; however, in his view there was a major impediment in that the Soviet people had developed a "slave psychology" after centuries of Tsarist autocracy and Marxist-Leninist totalitarianism. Held at the Kremlin Palace of Congresses, the conference brought together 5000 delegates and featured arguments between hardliners and liberalisers. The proceedings were televised, and for the first time since the 1920s, voting was not unanimous. In the months following the conference, Gorbachev focused on redesigning and streamlining the party apparatus; the Central Committee staff—which then numbered around 3000—was halved, while various Central Committee departments were merged to cut down the overall number from 20 to nine. In March and April 1989, elections to the new Congress were held. Of the 2,250 legislators to be elected, one hundred — termed the "Red Hundred" by the press — were directly chosen by the Communist Party, with Gorbachev ensuring many were reformists. Although over 85% of elected deputies were party members, many of those elected—including Sakharov and Yeltsin—were liberalisers. Gorbachev was happy with the result, describing it as "an enormous political victory under extraordinarily difficult circumstances". The new Congress convened in May 1989. Gorbachev was then elected its chair — the new de facto head of state — with 2,123 votes in favour to 87 against. Its sessions were televised live, and its members elected the new Supreme Soviet. At the Congress, Sakharov spoke repeatedly, exasperating Gorbachev with his calls for greater liberalisation and the introduction of private property. After Sakharov died shortly after, Yeltsin became the figurehead of the liberal opposition. Gorbachev tried to improve relations with the UK, France, and West Germany; like previous Soviet leaders, he was interested in pulling Western Europe away from U.S. influence. Calling for greater pan-European co-operation, he publicly spoke of a "Common European Home" and of a Europe "from the Atlantic to the Urals". In March 1987, Thatcher visited Gorbachev in Moscow; despite their ideological differences, they liked one another. In April 1989 he visited London, lunching with Elizabeth II. In May 1987, Gorbachev again visited France, and in November 1988 Mitterrand visited him in Moscow. The West German Chancellor, Helmut Kohl, had initially offended Gorbachev by comparing him to Nazi propagandist Joseph Goebbels, although later informally apologised and in October 1988 visited Moscow. In June 1989 Gorbachev then visited Kohl in West Germany. In November 1989 he also visited Italy, meeting with Pope John Paul II. Gorbachev's relationships with these West European leaders were typically far warmer than those he had with their Eastern Bloc counterparts. Gorbachev continued to pursue good relations with China to heal the Sino-Soviet Split. In May 1989 he visited Beijing and there met its leader Deng Xiaoping; Deng shared Gorbachev's belief in economic reform but rejected calls for democratisation. Pro-democracy students had amassed in Tiananmen Square during Gorbachev's visit but after he left were massacred by troops. Gorbachev did not condemn the massacre publicly but it reinforced his commitment not to use violent force in dealing with pro-democracy protests in the Eastern Bloc. Following the failures of earlier talks with the U.S., in February 1987, Gorbachev held a conference in Moscow, titled "For a World without Nuclear Weapons, for Mankind's Survival", which was attended by various international celebrities and politicians. By publicly pushing for nuclear disarmament, Gorbachev sought to give the Soviet Union the moral high ground and weaken the West's self-perception of moral superiority. Aware that Reagan would not budge on SDI, Gorbachev focused on reducing "Intermediate-Range Nuclear Forces", to which Reagan was receptive. In April 1987, Gorbachev discussed the issue with U.S. Secretary of State George P. Shultz in Moscow; he agreed to eliminate the Soviets' SS-23 rockets and allow U.S. inspectors to visit Soviet military facilities to ensure compliance. There was hostility to such compromises from the Soviet military, but following the May 1987 Mathias Rust incident—in which a West German teenager was able to fly undetected from Finland and land in Red Square—Gorbachev fired many senior military figures for incompetence. In June 1988, Gorbachev visited Washington D.C., where he and Reagan signed the Intermediate-Range Nuclear Forces Treaty. Taubman called it "one of the highest points of Gorbachev's career". A second U.S.-Soviet summit occurred in Moscow in May-June 1988, which Gorbachev expected to be largely symbolic. Again, he and Reagan criticised each others' countries—Reagan raising Soviet restrictions on religious freedom; Gorbachev highlighting poverty and racial discrimination in the U.S.—but Gorbachev related that they spoke "on friendly terms". They reached an agreement on notifying each other before conducting the ballistic missile test and made agreements on transport, fishing, and radio navigation. 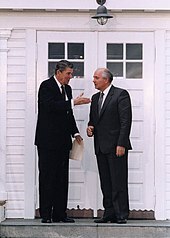 At the summit, Reagan told reporters that he no longer considered the Soviet Union an "evil empire" and the duo revealed that they considered themselves friends. The third summit was held in New York City in December. Arriving there, Gorbachev gave a speech to the United Nations Assembly where he announced a unilateral reduction in the Soviet armed forces by 500,000; he also announced that 50,000 troops would be withdrawn from Central and Eastern Europe. He then met with Reagan and President-elect George H. W. Bush; he rushed home, skipping a planned visit to Cuba, to deal with the Armenian earthquake. On becoming U.S. President, Bush appeared interested in continuing talks with Gorbachev but wanted to appear tougher on the Soviets than Reagan had to allay criticism from the right-wing of his Republican Party. In December 1989, Gorbachev and Bush met at the Malta Summit. Bush offered to assist the Soviet economy by suspending the Jackson-Vanik Amendment and repealing the Stevenson and Baird Amendments. There, the duo agreed to a joint press conference, the first time that a U.S. and Soviet leader had done so. Gorbachev also urged Bush to normalise relations with Cuba and meet its President, Fidel Castro, although Bush refused to do so. 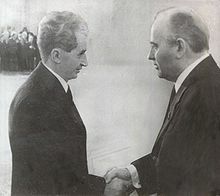 Gorbachev meeting the Romanian Marxist-Leninist leader Nicolae Ceauşescu. According to Taubman, Ceauşescu was Gorbachev's "favorite punching bag". On taking power, Gorbachev found some unrest among different national groups within the Soviet Union. In December 1986, riots broke out in several Kazakh cities after a Russian was appointed head of the region. In 1987, Crimean Tatars protested in Moscow to demand resettlement in Crimea, the area from which they had been deported on Stalin's orders in 1944. Gorbachev ordered a commission, headed by Gromyko, to examine their situation. By 1988, the Soviet "nationality question" was increasingly pressing. In February, the administration of the Nagorno-Karabakh region officially requested that it be transferred from the Azerbaijan Soviet Socialist Republic to the Armenian Soviet Socialist Republic; the majority of the region's population were ethnically Armenian and wanted unification with other majority Armenian areas. As rival Armenian and Azerbaijani demonstrations took place in Nagorno-Karabakh, Gorbachev called an emergency meeting of the Politburo. Ultimately, Gorbachev promised greater autonomy for Nagorno-Karabakh but refused the transfer, fearing that it would set off similar ethnic tensions and demands throughout the Soviet Union. That month, in the Azerbaijani city of Sumgait, Azerbaijani gangs began killing members of the Armenian minority. Local troops tried to quell the unrest but were attacked by mobs. The Politburo ordered additional troops into the city, but in contrast to those like Ligachev who wanted a massive display of force, Gorbachev urged restraint. He believed that the situation could be resolved through a political solution, urging talks between the Armenian and Azerbaijani Communist Parties. Further anti-Armenian violence broke out in Baku in 1990. Problems also emerged in the Georgian Soviet Socialist Republic; in April 1989, Georgian nationalists demanding independence clashed with troops in Tbilisi, resulting in various deaths. Independence sentiment was also rising in the Baltic states; the Supreme Soviets of the Estonian, Lithuanian, and Latvian Soviet Socialist Republics declared their economic "autonomy" from Russia and introduced measures to restrict Russian immigration. In August 1989, protesters formed the Baltic Way, a human chain across the three republics to symbolise their wish for independence. That month, the Lithuanian Supreme Soviet ruled the 1940 Soviet annexation of their country to be illegal; in January 1990, Gorbachev visited the republic to encourage it to remain part of the Soviet Union. Gorbachev rejected the "Brezhnev Doctrine", the idea that the Soviet Union had the right to intervene militarily in other Marxist-Leninist countries if their governments were threatened. In December 1987 he announced the withdrawal of 500,000 Soviet troops from Central and Eastern Europe. While pursuing domestic reforms, he did not publicly supported reformers elsewhere in the Eastern Bloc. Hoping instead to lead by example, he later related that he did not want to interfere in their internal affairs, but he may have feared that pushing reform in Central and Eastern Europe would have angered his own hardliners too much. Some Eastern Bloc leaders, like Hungary's János Kádár and Poland's Wojciech Jaruzelski, were sympathetic to reform; others, like Romania's Nicolae Ceaușescu, were hostile to it. In May 1987 Gorbachev visited Romania, where he was appalled by the state of the country, later telling the Politburo that there "human dignity has absolutely no value". He and Ceauşescu disliked each other, and argued over Gorbachev's reforms. In the Revolutions of 1989, most of the Marxist-Leninist states of Central and Eastern Europe held multi-party elections resulting in regime change. In most countries, like Poland and Hungary, this was achieved peacefully, but in Romania the revolution turned violent and led to Ceaușescu's overthrow and execution. Gorbachev was too preoccupied with domestic problems to pay much attention to these events. He believed that democratic elections would not lead Eastern European countries into abandoning their commitment to socialism. 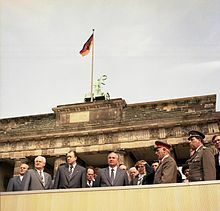 In 1989 he visited East Germany for the fortieth anniversary of its founding; shortly after, in November, the East German government allowed its citizens to cross the Berlin Wall, a decision Gorbachev praised. Neither Gorbachev nor Thatcher or Mitterrand wanted a swift reunification of Germany, aware that it would likely become the dominant European power. Gorbachev wanted a gradual process of German integration but Kohl began calling for rapid reunification. With Germany reunified, many observers declared the Cold War over. 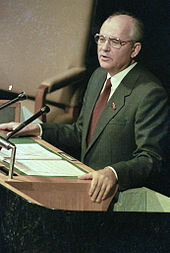 Gorbachev addressing the United Nations General Assembly in December 1988. During the speech he dramatically announced deep unilateral cuts in Soviet military forces in Eastern Europe. In February 1990, both liberalisers and Marxist-Leninist hardliners intensified their attacks on Gorbachev. A liberaliser march took part in Moscow criticising Communist Party rule, while at a Central Committee meeting, the hardliner Vladimir Brovikov accused Gorbachev of reducing the country to "anarchy" and "ruin" and of pursuing Western approval at the expense of the Soviet Union and the Marxist-Leninist cause. Gorbachev was aware that the Central Committee could still oust him as General Secretary, and so decided to reformulate the role of head of government to a Presidency from which they could not remove him. He decided that the presidential election should be held by the Congress of People's Deputies. He chose this over a public vote because he thought the latter would escalate tensions and feared that he might lose it; a spring 1990 poll nevertheless still showed him as the most popular politician in the country. In March, the Congress of People's Deputies held the first (and only) Soviet presidential election, in which Gorbachev was the only candidate. He secured 1,329 in favour to 495 against; 313 votes were invalid or absent. He therefore became the first executive President of the Soviet Union. A new 18-member Presidential Council de facto replaced the Politburo. At the same Congress meeting, he presented the idea of repealing Article 6 of the Soviet constitution, which had ratified the Communist Party as the "ruling party" of the Soviet Union. The Congress passed the reform, undermining the de jure nature of the one-party state. In the 1990 elections for the Russian Supreme Soviet, the Communist Party faced challengers from an alliance of liberalisers known as "Democratic Russia"; the latter did particularly well in urban centers. Yeltsin was elected the parliament's chair, something Gorbachev was unhappy about. That year, opinion polls showed Yeltsin overtaking Gorbachev as the most popular politician in the Soviet Union. Gorbachev struggled to understand Yeltsin's popularity, commenting: "he drinks like a fish... he's inarticulate, he comes up with the devil knows what, he's like a worn-out record." The Russian Supreme Soviet was now out of Gorbachev's control; in June 1990, it declared that in the Russian Republic, its laws took precedence over those of the Soviet central government. Amid a growth in Russian nationalist sentiment, Gorbachev had reluctantly allowed the formation of a Communist Party of the Russian Soviet Federative Socialist Republic as a branch of the larger Soviet Communist Party. Gorbachev attended its first congress in June, but soon found it dominated by hardliners who opposed his reformist stance. In January 1990, Gorbachev privately agreed to permit East German reunification with West Germany, but rejected the idea that a unified Germany could retain West Germany's NATO membership. His compromise that Germany might retain both NATO and Warsaw Pact memberships did not attract support. In May 1990, he visited the U.S. for talks with Bush; there, he agreed that an independent Germany would have the right to choose its international alliances. He later revealed that he had agreed to do so because U.S. Secretary of State James Baker promised that NATO troops would not be posted to eastern Germany and that the military alliance would not expand into Eastern Europe. Privately, Bush ignored Baker's assurances and later pushed for NATO expansion. On the trip, the U.S. informed Gorbachev of its evidence that the Soviet military—possibly unbeknownst to Gorbachev—had been pursuing a biological weapons program in contravention of the 1987 Biological Weapons Convention. In July, Kohl visited Moscow and Gorbachev informed him that the Soviets would not oppose a reunified Germany being part of NATO. Domestically, Gorbachev's critics accused him of betraying the national interest; more broadly, they were angry that Gorbachev had allowed the Eastern Bloc to move away from direct Soviet influence. In August 1990, Saddam Hussein's Iraqi government invaded Kuwait; Gorbachev endorsed Bush's condemnation it. This brought criticism from many in the Soviet state apparatus, who saw Hussein as an key ally in the Gulf and feared for the safety of the 9000 Soviet citizens in Iraq, although Gorbachev argued that the Iraqis were the clear aggressors in the situation. In November the Soviets endorsed a UN Resolution permitting force to be used in expelling the Iraqi Army from Kuwait. Gorbachev later called it a "watershed" in world politics, "the first time the superpowers acted together in a regional crisis." However, when the U.S. announced plans for a ground invasion, Gorbachev opposed it, urging instead a peaceful solution. In October 1990, Gorbachev was awarded the Nobel Peace Prize; he was flattered but acknowledged "mixed feelings" about the accolade. Polls indicated that 90% of Soviet citizens disapproved of the award. With the Soviet budget deficit climbing and no domestic money markets to provide the state with loans, Gorbachev looked elsewhere. Throughout 1991, Gorbachev requested sizeable loans from Western countries and Japan, hoping to keep the Soviet economy afloat and ensure the success of perestroika. Although the Soviet Union had been excluded from the G7, Gorbachev secured an invite to its London summit in July 1991. There, he continued to call for financial assistance; Mitterrand and Kohl backed him, while Thatcher—no longer in office— also urged Western leaders to agree. Most G7 members were reluctant, instead offering technical assistance and proposing the Soviets receive "special associate" status—rather than full membership—of the World Bank and International Monetary Fund. Gorbachev was frustrated that the U.S. would spent $100 billion on the Gulf War but would not offer his country loans. Other countries were more forthcoming; West Germany had given the Soviets DM60 billion by mid-1991. Later that month, Bush visited Moscow, where he and Gorbachev signed the START I treaty after ten years of negotiation. At the 28th Communist Party Congress in July, hardliners criticised the reformists but Gorbachev was re-elected party leader with the support of three-quarters of delegates and his choice of Deputy General Secretary, Vladimir Ivashko, was also elected. Seeking compromise with the liberalisers, Gorbachev assembled a team of both his own and Yeltsin's advisers to come up with an economic reform package: the result was the "500 Days" programme. This called for further decentralisation and some privatisation. Gorbachev described the plan as "modern socialism" rather than a return to capitalism but had many doubts about it. In September, Yeltsin presented the plan to the Russian Supreme Soviet, which backed it. Many in the Communist Party and state apparatus warned against it, arguing that it would create marketplace chaos, rampant inflation, and unprecedented levels of unemployment. The 500 Days plan was abandoned. At this, Yeltsin rallied against Gorbachev in an October speech, claiming that Russia would no longer accept a subordinate position to the Soviet government. By mid-November 1990, much of the press was calling for Gorbachev's resignation and predicting civil war. Hardliners were urging Gorbachev to disband the presidential council and arrest vocal liberals in the media. In November, he addressed the Supreme Soviet where he announced an eight-point program, which included governmental reforms, among them the abolition of the presidential council. By this point, Gorbachev was isolated from many of his former close allies and aides. Yakovlev had moved out of his inner circle and Shevardnadze had resigned. His support among the intelligentsia was declining, and by the end of 1990 his approval ratings had plummeted. Amid growing dissent in the Baltics, especially Lithuania, in January 1991 Gorbachev demanded that the Lithuanian Supreme Council rescind its pro-independence reforms. Soviet troops occupied several Vilnius buildings and clashed with protesters, 15 of whom were killed. Gorbachev was widely blamed by liberalisers, with Yeltsin calling for his resignation. Gorbachev denied sanctioning the military operation, although some in the military claimed that he had; the truth of the matter was never clearly established. Fearing more civil disturbances, that month Gorbachev banned demonstrations and ordered troops to patrol Soviet cities alongside the police. This further alienated the liberalisers but was not enough to win-over hardliners. Wanting to preserve the Union, in April Gorbachev and the leaders of nine Soviet republics jointly pledged to prepare a treaty that would renew the federation under a new constitution; six of the republics—Estonia, Latvia, Lithuania, Moldova, Georgia, and Armenia—did not endorse this. A referendum on the issue brought 76.4% in favour of continued federation but the six rebellious republics had not taken part. Negotiations as to what form the new constitution would take took place, again bringing together Gorbachev and Yeltsin in discussion; it was planned to be formally signed in August. In August, Gorbachev and his family holidayed at their dacha, "Zarya" ('Dawn') in Foros, Crimea. Two weeks into his holiday, a group of senior Communist Party figures—the "Gang of Eight"—calling themselves the State Committee on the State of Emergency launched a coup d'état to seize control of the Soviet Union. The phone lines to his dacha were cut and a group arrived, including Boldin, Shenin, Baklanov, and General Varennikov, informing him of the take-over. The coup leaders demanded that Gorbachev formally declare a state of emergency in the country, but he refused. Gorbachev and his family were kept under house arrest in their dacha. The coup plotters publicly announced that Gorbachev was ill and thus Vice President Yanayev would take charge of the country. Yeltsin, now President of the Russian Soviet Federative Socialist Republic, went inside the Moscow White House. Tens of thousands of protesters amassed outside it to prevent troops storming the building to arrest him. Gorbachev feared that the coup plotters would order him killed, so had his guards barricade his dacha. However, the coup's leaders realised that they lacked sufficient support and ended their efforts. On 21 August, Vladimir Kryuchkov, Dmitry Yazov, Oleg Baklanov, and Anatoly Lukyanov, and Vladimir Ivashko arrived at Gorbachev's dacha to inform him that they were doing so. That evening, Gorbachev returned to Moscow, where he thanked Yeltsin and the protesters for helping to undermine the coup. At a subsequent press conference, he pledged to reform the Soviet Communist Party. Two days later, he resigned as its General Secretary and called on the Central Committee to disband. Several members of the coup committed suicide; others were fired. Gorbachev attended a session of the Russian Supreme Soviet on 23 August, where Yeltsin aggressively criticised him for having appointed and promoted many of the coup members to start with. Yeltsin then announced a ban on the Russian Communist Party. On 30 October, Gorbachev attended a conference in Madrid trying to revive the Israeli–Palestinian peace process. The event was co-sponsored by the U.S. and Soviet Union, one of the first examples of such cooperation between the two countries. There, he again met with Bush. En route home, he travelled to France where he stayed with Mitterrand at the latter's home near Bayonne. After the coup, Gorbachev continued to pursue plans for a new union treaty but found increasing opposition to the idea of a continued federal state as the leaders of various Soviet republics bowed to growing nationalist pressure. Yeltsin stated that he would veto any idea of a unified state, instead favouring a confederation with little central authority. Only the leaders of the Kazakh and Kirghiz Soviet Socialist Republics supported Gorbachev's approach. On 1 December, a referendum in Ukraine produced over 90% support for secession from the Union; Gorbachev had expected the Ukrainians to reject independence. Without Gorbachev's knowledge, Yeltsin met with Ukrainian President Leonid Kravchuk and Belarusian President Stanislav Shushkevich in Belovezha Forest, near Brest, Belarus, on 8 December and signed the Belavezha Accords, which declared the Soviet Union had ceased to exist and formed the Commonwealth of Independent States (CIS) as its successor. Gorbachev only learned of this development when Shushkevich phoned him; Gorbachev was furious. He desperately looked for an opportunity to preserve the Soviet Union, hoping in vain that the media and intelligentsia might rally against the idea of its dissolution. The Ukrainian, Belarussian, and Russian Supreme Soviets then ratified the establishment of the CIS. On 10 December, he issued a statement calling the CIS agreement "illegal and dangerous". On 20 December, the leaders of 11 of the 12 remaining republics–all except Georgia–met in Alma-Ata and signed the Alma-Ata Protocol, agreeing to dismantle the Soviet Union and formally establish the CIS. They also provisionally accepted Gorbachev's resignation as president of what remained of the Soviet Union. Gorbachev revealed that he would resign as soon as he saw that the CIS was a reality. Yeltsin was tasked with overseeing the transfer of power from Gorbachev to its successor states. He and Gorbachev agreed that the latter would formally announce his resignation as Soviet President and Commander-in-Chief on 25 December, before vacating the Kremlin by 29 December. Yakovlev, Chernyaev, and Shevardnadze joined Gorbachev to help him write a resignation speech. Gorbachev then gave his speech in the Kremlin in front of television cameras, allowing for international broadcast. In it, he announced, "I hereby discontinue my activities at the post of President of the Union of Soviet Socialist Republics." He expressed regret for the breakup of the Soviet Union but cited what he saw as the achievements of his administration: political and religious freedom, the end of totalitarianism, the introduction of democracy and a market economy, and an end to the arms race and Cold War. Gorbachev was only the second Soviet leader, after Khrushchev, not to die in office. The following day, the Council of the Republics (formerly the Soviet of Nationalities), the upper house of the Supreme Soviet, voted both itself and the Soviet Union out of existence. The Soviet Union officially ceased to exist at midnight on 31 December 1991. Out of office, Gorbachev had more time to spend with his wife and family. He and Raisa initially lived in their dilapidated dacha on Rublevskoe Shosse, although were also allowed to privatise their small apartment on Kosygin Street. He focused on establishing his International Foundation for Socio-Economic and Political Studies, or "Gorbachev Foundation", launched in March 1992; Yakovlev and Grigory Revenko were its first Vice Presidents. Its initial tasks were in analysing and publishing material on the history of perestroika, as well as defending the policy from what it called "slander and falsifications". The foundation also tasked itself with monitoring and critiquing life in post-Soviet Russia and presenting alternate forms of development to those pursued by Yeltsin. In 1993, Gorbachev launched Green Cross International, which focused on encouraging sustainable futures, and then the World Political Forum. To finance his foundation, Gorbachev began lecturing internationally, charging large fees to do so. On a visit to Japan, he was well received and given multiple honorary degrees. In 1992, he toured the U.S. in a Forbes private jet to raise money for his foundation. During the trip he met up with the Reagans for a social visit. From there he went to Spain, where he attended the Expo '92 world fair in Seville and also met with Prime Minister Felipe González, who had become a friend of his. In March, he visited Germany, where he was received warmly by many politicians who praised his role in facilitating German reunification. To supplement his lecture fees and book sales, Gorbachev appeared in print and television adverts for companies like Pizza Hut and Louis Vuitton, enabling him to keep the foundation afloat. With his wife's assistance, Gorbachev worked on his memoires, which were published in Russian in 1995 and in English the following year. He also began writing a monthly syndicated column for The New York Times. Gorbachev had promised to refrain from criticising Yeltsin while the latter pursued democratic reforms, but soon the two men were publicly criticising each other again. After Yeltsin's decision to lift price caps generated massive inflation and plunged many Russians into poverty, Gorbachev openly criticised him, comparing the reform to Stalin's policy of forced collectivisation. After pro-Yeltsin parties did poorly in the 1993 legislative election, Gorbachev called on him to resign. In 1995 his foundation held a conference on "The Intelligentsia and Perestroika". It was there that Gorbachev proposed to the Duma a law that would reduce many of the presidential powers established by Yeltsin's 1993 constitution. Gorbachev continued to defend perestroika but acknowledged that he had made tactical errors as Soviet leader. While he still believed that Russia was undergoing a process of democratisation, he concluded that it would take decades rather than years, as he had previously thought. 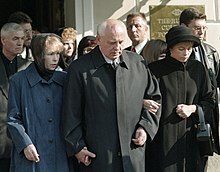 The Russian presidential elections were scheduled for June 1996, and although his wife and most of his friends urged him not to run, Gorbachev decided to do so. He hated the idea that the election would result in a run-off between Yeltsin and Gennady Zyuganov, the Communist Party of the Russian Federation candidate whom Yeltsin saw as a Stalinist hardliner. He never expected to win outright but thought a centrist bloc could be formed around either himself or one of the other candidates with similar views, such as Grigory Yavlinsky, Svyatoslav Fyodorov, or Alexander Lebed. After securing the necessary one million signatures of nomination, he announced his candidacy in March. Launching his campaign, he travelled across Russia giving rallies in twenty cities. He repeatedly faced anti-Gorbachev protesters, while some pro-Yeltsin local officials tried to hamper his campaign by banning local media from covering it or by refusing him access to venues. In the election, Gorbachev came seventh with circa 386,0000 votes, or around 0.5% of the total. Yeltsin and Zyuganov went through to the second round, where the former was victorious. In contrast to her husband's political efforts, Raisa had focused on campaigning for children's charities. In 1997 she founded a sub-division of the Gorbachev Foundation known as Raisa Maksimovna's Club to focus on improving women's welfare in Russia. The Foundation had initially been housed in the former Social Science Institute building, but Yeltsin introduced limits to the number of rooms it could use there; the American philanthropist Ted Turner then donated over $1 million to enable the foundation to build a new premises on the Leningradsky Prospekt. In 1999, Gorbachev made his first visit to Australia, where he gave a speech to the country's parliament. Shortly after, in July, Raisa was diagnosed with leukaemia. With the assistance of German Chancellor Gerhard Schröder, she was transferred to a cancer centre in Münster, Germany and there underwent chemotherapy. In September she fell into a coma and died. After Raisa's passing, Gorbachev's daughter Irina and his two granddaughters moved into his Moscow home to live with him. When questioned by journalists, he said that he would never remarry. In December 1999, Yeltsin resigned and was succeeded by his deputy, Vladimir Putin, who then won the March 2000 presidential election. Gorbachev attended Putin's inauguration ceremony in May, the first time he had entered the Kremlin since 1991. Gorbachev initially welcomed Putin's rise, seeing him as anti-Yeltsin figure. Although he spoke out against some of the Putin government's actions, Gorbachev also had praise for the new regime; in 2002 he said that "I've been in the same skin. That's what allows me to say what [Putin's] done is in the interest of the majority". At the time, he believed Putin to be a committed democrat who nevertheless had to use "a certain dose of authoritarianism" to stabilize the economy and rebuild the state after the Yeltsin era. At Putin's request, Gorbachev became co-chair of the "Petersburg Dialogue" project between high-ranking Russians and Germans. In 2000, Gorbachev helped form the Russian United Social Democratic Party. In June 2002 he had a meeting with Putin, who praised the venture, suggesting that a centre-left party could be good for Russia and that he would be open to working with it. In 2003, Gorbachev's party merged with the Social Democratic Party to form the Social Democratic Party of Russia, which faced much internal division and failed to gain traction with voters. Gorbachev resigned as party leader in May 2004 following a disagreement with the party's chairman over the direction taken in the 2003 election campaign. The party was later banned in 2007 by the Supreme Court of the Russian Federation due to its failure to establish local offices with at least 500 members in the majority of Russian regions, which is required by Russian law for a political organization to be listed as a party. Later that year, Gorbachev founded a new political party, the Union of Social Democrats. Gorbachev was critical of U.S. hostility to Putin, arguing that the U.S. government "doesn't want Russia to rise" again as a global power and wants "to continue as the sole superpower in charge of the world". More broadly, Gorbachev was critical of U.S. policy following the Cold War, arguing that the West had attempted to "turn [Russia] into some kind of backwater". He rejected the idea – expressed by Bush – that the U.S. had "won" the Cold War, arguing that both sides had cooperated to end the conflict. He claimed that since the fall of the Soviet Union, the U.S., rather than cooperating with Russia, had conspired to build a "new empire headed by themselves". He was critical of how the U.S. had expanded NATO right up to Russia's borders despite their initial assurances that they would not do so, citing this as evidence that the U.S. government could not be trusted. He spoke out against the 1999 NATO bombing of Yugoslavia because it lacked UN backing, as well as the 2003 invasion of Iraq led by the U.S. In June 2004 Gorbachev nevertheless attended Reagan's state funeral, and in 2007 visited New Orleans to see the damage caused by Hurricane Katrina. Barred by the constitution from serving more than two consecutive terms as President, Putin stood down in 2008 and was succeeded by his Prime Minister, Dmitry Medvedev, who reached out to Gorbachev in ways that Putin had not. In September 2008, Gorbachev and business oligarch Alexander Lebedev announced they would form the Independent Democratic Party of Russia, and in May 2009 Gorbachev announced that the launch was imminent. After the outbreak of the 2008 South Ossetia war between Russia and South Ossetian separatists on one side and Georgia on the other, Gorbachev spoke out against U.S. support for Georgian President Mikheil Saakashvili and for moving to bring the Caucasus into the sphere of its national interest. Gorbachev nevertheless remained critical of Russia's government and criticised the 2011 parliamentary elections as being rigged in favour of the governing party, United Russia, and called for them to be re-held. After protests broke out in Moscow over the election, Gorbachev praised the protesters. In 2009 he released Songs for Raisa, an album of Russian romantic ballads, sung by him and accompanied by musician Andrei Makarevich, to raise money for a charity devoted to his late wife. That year he also met with U.S. President Barack Obama in efforts to "reset" strained U.S.-Russian relations, and attended an event in Berlin commemorating the twentieth anniversary of the fall of the Berlin Wall. In 2011, an eightieth birthday gala for him was held at London's Royal Albert Hall, featuring tributes from Simon Peres, Lech Wałęsa, Michel Rocard, and Arnold Schwarzenegger. Proceeds from the event went to the Raisa Gorbachev Foundation. That year, Medvedev awarded him the Order of St Andrew the Apostle the First-Called. In 2012, Putin announced that he was standing again as President, something Gorbachev was critical of. He complained that Putin's new measures had "tightened the screws" on Russia and that the president was trying to "completely subordinate society", adding that United Russia now "embodied the worst bureaucratic features of the Soviet Communist party". In 2013, he noted that in Russia, "politics is increasingly turning into imitation democracy" with "all power in the hands of the executive branch". Gorbachev was in increasingly poor health; in 2011 he had spinal operation and in 2014 oral surgery. In 2015, Gorbachev ceased his pervasive international traveling. He continued to speak out on issues affecting Russia and the world. In 2014, he defended the Crimean status referendum that led to Russia's annexation of Crimea. He noted that while Crimea was transferred from Russia to Ukraine in 1954, when both were part of the Soviet Union, the Crimean people had not been asked at the time, whereas in the 2014 referendum they had. After sanctions were placed on Russia as a result of the annexation, Gorbachev spoke out against them. His comments led to Ukraine banning him from entering the country for five years. Russia can succeed only through democracy. Russia is ready for political competition, a real multiparty system, fair elections and regular rotation of government. This should define the role and responsibility of the President. At a November 2014 event marking 25 years since the fall of the Berlin Wall, Gorbachev warned that the Ukraine conflict had brought the world to the brink of a new cold war, and he charged western powers, particularly the United States, with adopting an attitude of "triumphalism" towards Russia. In July 2016, Gorbachev criticized NATO amid escalating tensions between the military alliance and Russia. Gorbachev has accused NATO of preparing for a "hot" war against Russia, saying that "All the rhetoric in Warsaw just yells of a desire almost to declare war on Russia. They only talk about defence, but actually they are preparing for offensive operations." In June 2018, he welcomed the 2018 Russia–United States summit between Putin and U.S. President Donald Trump, although in October criticised Trump's threat to withdraw from the 1987 Intermediate-Range Nuclear Forces Treaty, saying the move "is not the work of a great mind." He added: "all agreements aimed at nuclear disarmament and the limitation of nuclear weapons must be preserved for the sake of life on Earth." Gorbachev is also a member of the Club of Madrid, a group of more than 80 former leaders of democratic countries, which works to strengthen democratic governance and leadership. 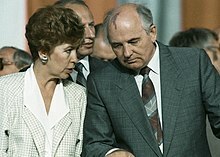 Even before he left office, Gorbachev had become a kind of social democrat—believing in, as he later put it, equality of opportunity, publicly supported education and medical care, a guaranteed minimum of social welfare, and a "socially oriented market economy"—all within a democratic political framework. Exactly when this transformation occurred is hard to say, but surely by 1989 or 1990 it had taken place. Gorbachev was a socialist. His friend Mlynář, with whom he studied at university, related that in the early 1950s "Gorbachev, like everyone else at the time, was a Stalinist." Mlynář added that "Unlike most Soviet students, [Gorbachev] did not see Marxist theory as a collection of axioms to be committed to memory." Biographers Doder and Branson related that after Stalin's death, Gorbachev's "ideology would never be doctrinal again", but noted that he remained "a true believer" in the Soviet system. Gorbachev's political outlook was shaped by the 23 years he served as a party official in Stavropol. Doder and Branson noted that at the Twenty-Seventh Party Congress in 1986, Gorbachev was seen to be "a communist, a true believer, and a Russian patriot". That year, the biographer Zhores Medvedev stated that "Gorbachev is neither a liberal nor a bold reformist". In the early years of his rule, Gorbachev argued that the Communist Party had to adapt to changing circumstances, and engage in creative thinking much as Lenin had creatively interpreted and adapted the writings of Karl Marx and Friedrich Engels to the situation of early 20th century Russia. For instance, he thought that rhetoric about global revolution and overthrowing the bourgeoise—which had been integral to Leninist politics—had become too dangerous in an era where nuclear warfare could obliterate humanity. He began to move away from the Marxist-Leninist belief in class struggle as the engine of political change, instead viewing politics as a ways of co-ordinating the interests of all classes. According to Doder and Branson, he also wanted to "dismantle the hierarchical military society at home and abandon the grand-style, costly, imperialism abroad". They added that throughout most of his political career prior to becoming General Secretary, "his publicly expressed views almost certainly reflected a politician's understanding of what should be said, rather than his personal philosophy. Otherwise he could not have survived politically." Like many Russians, Gorbachev sometimes thought of the Soviet Union as being largely synonymous with Russia and in various speeches described it as "Russia"; in one incident he had to correct himself after calling the USSR "Russia" while giving a speech in Kiev, Ukraine. McCauley noted that perestroika was "an elusive concept", one which "evolved and eventually meant something radically different over time." McCauley stated that the concept originally referred to "radical reform of the economic and political system" as part of Gorbachev's attempt to motivate the labour force and make management more effective. It was only after initial measures to achieve this proved unsuccessful that Gorbachev began to consider market mechanisms and co-operatives, albeit with the state sector remaining dominant. With perestroika, Gorbachev had wanted to improve the existing Marxist-Leninist system but ultimately ended up destroying it. Taubman described Gorbachev as "a true believer—not in the Soviet system as it functioned (or didn't) in 1985 but in its potential to live up to what he deemed its original ideals." He added that "until the end, Gorbachev reiterated his belief in socialism, insisting that it wasn't worthy of the name unless it was truly democratic." 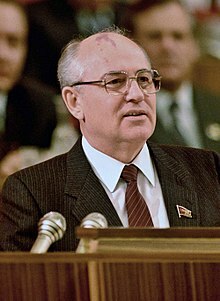 As Soviet leader, Gorbachev believed in incremental reform rather than a radical transformation; he later referred to this as a "revolution by evolutionary means". Taubman noted that by 1989 or 1990, Gorbachev had transformed into a social democrat. McCauley suggested that by at least June 1991 Gorbachev was a "post-Leninist", having "liberated himself" from Marxism-Leninism. After the fall of the Soviet Union, the newly formed Communist Party of the Russian Federation would have nothing to do with him. However, in 2006, he expressed his continued belief in Lenin's ideas: "I trusted him then and I still do". He claimed that "the essence of Lenin" was a desire to develop "the living creative activity of the masses". Taubman believed that Gorbachev identified with Lenin on a psychological level. Gorbachev was self-confident, polite, and tactful; he had a happy and optimistic temperament. He used self-deprecating humour, and sometimes used profanities. Gorbachev often referred to himself in the Third person. His university friend, Mlynář, described him as "loyal and personally honest". He was a skilled manager, and had a good memory. Zhores Medvedev thought him a talented orator, in 1986 stating that "Gorbachev is probably the best speaker there has been in the top Party echelons" since Leon Trotsky. Medvedev also thought Gorbachev "a charismatic leader", something Brezhnev, Andropov, and Chernenko had not been. Doder and Branson called him "a charmer capable of intellectually seducing doubters, always trying to co-opt them, or at least blunt the edge of their criticism". McCauley thought Gorbachev displayed "great tactical skill" in manoeuvring successfully between hardline Marxist-Leninists and liberalisers for most of his time as leader, although added that he was "much more skilled at tactical, short-term policy than strategic, long-term thinking", in part because he was "given to making policy on the hoof". Since studying at university, Gorbachev considered himself an intellectual; Doder and Branson thought that "his intellectualism was slightly self-conscious", noting that unlike most Russian intelligentsia, Gorbachev was not closely connected "to the world of science, culture, the arts, or education". When living in Stavropol he and his wife collected hundreds of books. Among his favourite authors were Arthur Miller, Dostoevsky, and Chingiz Aitmatov, while he also enjoyed reading detective fiction. He enjoyed walking as a hobby, and had a love of natural environments. He favoured small gatherings where the assembled discussed topics like art and philosophy rather than the large, alcohol-fuelled parties common among Soviet officials. Doder and Branson thought Gorbachev "a Russian to the core, intensely patriotic as only people living in the border regions can be." Taubman called him "a remarkably decent man"; he thought Gorbachev to have "high moral standards". He also noted that the former Soviet leader has a "sense of self-importance and self-righteousness" as well as a "need for attention and admiration" which grated on some of his colleagues. McCauley described him as having an "extraordinary sensitivity to personal criticism"; a number of Gorbachev's colleagues thought that he was easily offended. They were often frustrated that he would leave tasks unfinished, and sometimes also felt underappreciated and discarded by him. He was described as a hard worker or workaholic; as General Secretary, he would rise at 7 or 8 in the morning and not go to bed until 1 or 2. Biographers Doder and Branson thought that Gorbachev was "a puritan" with "a proclivity for order in his personal life". Taubman noted that he was "capable of blowing up for calculated effect". He also thought that by 1990, when his domestic popularity was waning, Gorbachev become "psychologically dependent on being lionized abroad", a trait for which he was criticised in the Soviet Union. McCauley was of the view that "one of his weaknesses was an inability to foresee the consequences of his actions". As an adult, Gorbachev reached five foot nine in height. He had a distinctive port-wine stain on the top of his head; by 1955 his hair was thinning, and by the late 1960s he was bald. Throughout his life, he tried to dress fashionably. He spoke in a southern Russian accent, and was known to sing both folk and pop songs. Throughout the 1960s he struggled against obesity and dieted to control the issue; Doder and Branson characterised him as "stocky but not fat". Ever since he was a young man, he had an aversion to hard liquor; he drank sparingly and did not smoke. He was protective of his private life and avoided inviting people to his home. Gorbachev cherished his wife, who in turn was extremely protective of him. He was an involved parent and grandparent. He sent his daughter to a local school in Stavropol rather than to a school set aside for the children of party elites. Unlike many of his contemporaries in the Soviet administration, he was not a womaniser and was known for treating women respectfully. When Gorbachev was growing up, his grandparents had been practicing Christians. In 2013, the Lubbock Avalanche-Journal reported a 1992 meeting between Gorbachev and Otis Gatewood, a Christian minister sent with a relief effort for orphans and elderly people in Russia by Churches of Christ in Texas. In the meeting, Gorbachev reportedly claimed that he was "indeed a Christian and had been baptized by his grandfather in the Volga River many years before". On 19 March 2008, during a surprise visit to pray at the tomb of Saint Francis in Assisi, Italy, Gorbachev made an announcement which has been interpreted to the effect that he was a Christian. Gorbachev stated: "St Francis is, for me, the alter Christus, another Christ. His story fascinates me and has played a fundamental role in my life". He added: "It was through St Francis that I arrived at the Church, so it was important that I came to visit his tomb". However, a few days later, he told the Russian news agency Interfax: "Over the last few days some media have been disseminating fantasies—I can't use any other word—about my secret Catholicism, [...] To sum up and avoid any misunderstandings, let me say that I have been and remain an atheist". Opinions on Gorbachev are deeply divided. Many, particularly in Western countries, see him as the greatest statesman of the second half of the twentieth century. U.S. press referred to the presence of "Gorbymania" in Western countries during the late 1980s and early 1990s, as represented by large crowds that turned out to greet his visits, and in the Soviet Union itself opinion polls indicated that Gorbachev was the most popular politician from 1985 through to late 1989. Taubman characterised Gorbachev as "a visionary who changed his country and the world—though neither as much as he wished." His negotiations with the U.S. helped bring an end to the Cold War and reduced the threat of nuclear conflict. His decision to allow the Eastern Bloc to break apart prevented significant bloodshed in Central and Eastern Europe; as Taubman noted, this meant that the "Soviet Empire" ended in a far more peaceful manner than the British Empire several decades before. McCauley noted that in facilitating the merger of East and West Germany, Gorbachev was "a co-father of German unification", assuring him long-term popularity among the German people. Gorbachev succeeded in destroying what was left of totalitarianism in the Soviet Union; he brought freedom of speech, of assembly, and of conscience to people who had never known it, except perhaps for a few chaotic months in 1917. By introducing free elections and creating parliamentary institutions, he laid the groundwork for democracy. It is more the fault of the raw material he worked with than of his own real shortcomings and mistakes that Russian democracy will take much longer to build than he thought. Taubman regarded Gorbachev as being "exceptional... as a Russian ruler and a world statesman", highlighting that he avoided the "traditional, authoritarian, anti-Western norm" of both predecessors like Brezhnev and successors like Putin. Under Gorbachev, the Soviet Union broke apart without falling into civil war, as happened during the breakup of Yugoslavia at the same time. McCauley thought that in allowing the Soviet Union to move away from Marxism-Leninism, Gorbachev gave the Soviet people "something precious, the right to think and manage their lives for themselves", with all the uncertainty and risk that that entailed. For many of the Communist Party nomenklatura, the dissolution of the Soviet Union was instead seen as a disaster as it resulted in their loss of power. In Russia, he is widely despised for his role in the collapse of the Soviet Union and the ensuing economic collapse. General Varennikov, one of those who orchestrated the 1991 coup attempt against Gorbachev, for instance called him "a renegade and traitor to your own people". Many of his critics attacked him for allowing the Marxist-Leninist governments across Eastern Europe to fall, and for allowing a reunited Germany to join NATO, something they deem to be contrary to Russia's national interest. During his career, Gorbachev attracted the admiration of some colleagues, but others came to hate him. Many Russians saw his emphasis on persuasion rather than force as a sign of weakness. The historian Mark Galeotti stressed the connection between Gorbachev and his predecessor, Andropov. In Galeotti's view, Andropov was "the godfather of the Gorbachev revolution", because—as a former head of the KGB—he was able to put forward the case for reform without having his loyalty to the Soviet cause questioned, an approach that Gorbachev was able to build on and follow through it. According to McCauley, Gorbachev "set reforms in motion without understanding where they could lead. Never in his worst nightmare could he have imagined that perestroika would lead to the destruction of the Soviet Union". In 1990, Gorbachev was awarded the Nobel Peace Prize for "his leading role in the peace process which today characterizes important parts of the international community". On 4 May 1992, Gorbachev was awarded the first ever Ronald Reagan Freedom Award at the Ronald Reagan Presidential Library in Simi Valley, California. On 6 May 1992, Gorbachev was awarded the honorary degree of Doctor of Laws from Westminster College in Fulton, Missouri. In 1993 Gorbachev was awarded a Legum Doctor, honoris causa from Carleton University in Ottawa, Canada. He was also given an honorary degree from The University of Calgary in Calgary, Alberta, Canada. Gorbachev was the 1994 recipient of the Grawemeyer Award for ideas improving world order, awarded by the University of Louisville, Kentucky. In 1995, Gorbachev received an Honorary Doctorate from Durham University in the United Kingdom for his contribution to "the cause of political tolerance and an end to Cold War-style confrontation". In 1995 he was awarded the Grand-Cross of the Order of Liberty by Portuguese President Mário Soares. For his historic role in the evolution of glasnost, and for his leadership in the disarmament negotiations with the United States during the Reagan administration, Gorbachev was awarded the Courage of Conscience award on 20 October 1996. In 1998, Gorbachev received the Freedom Award from the National Civil Rights Museum in Memphis, Tennessee. In 2002, Gorbachev received the Freedom of the City of Dublin from Dublin City Council. In 2002, Gorbachev received an honorary degree of a Doctor in Laws (LL.D.) "in recognition of his political service and contribution to peace" from Trinity College, Dublin, Ireland. In 2002, Gorbachev was awarded the Charles V Prize by the European Academy of Yuste Foundation. Gorbachev, together with Bill Clinton and Sophia Loren, were awarded the 2004 Grammy Award for Best Spoken Word Album for Children for their recording of Sergei Prokofiev's Peter and the Wolf for Pentatone. In 2005, Gorbachev was awarded the Point Alpha Prize for his role in supporting German reunification. He also received an honorary doctorate from the University of Münster. In 2011, Gorbachev was awarded a honoris causa doctorate from University of Liège in Liège, Belgium. Gorbachev, Mikhail. Memoirs. Doubleday (1996). ISBN 0-385-40668-1. Gorbachev, Mikhail and Daisaku Ikeda (2005). Moral Lessons of the Twentieth Century: Gorbachev and Ikeda on Buddhism and Communism. I. B. Tauris. ISBN 1-85043-976-1. Gorbachev, Mikhail. The New Russia. Polity (2016). ISBN 978-1-5095-0387-2. Gorbachev, Mikhail. In a changing world. (2018). ^ "Gorbachev". Random House Webster's Unabridged Dictionary. ^ "Gorbachev, Mikhail" (US) and "Gorbachev, Mikhail". Oxford Dictionaries. Oxford University Press. Retrieved 4 February 2019. ^ "Gorbachev". Merriam-Webster Dictionary. Retrieved 4 February 2019. ^ Medvedev 1986, p. 22; Doder & Branson 1990, p. 1; McCauley 1998, p. 15; Taubman 2017, p. 7. ^ Taubman 2017, p. 10. ^ McCauley 1998, p. 15; Taubman 2017, p. 10. ^ Doder & Branson 1990, p. 4; McCauley 1998, p. 15; Taubman 2017, p. 7. ^ Taubman 2017, pp. 8–9. ^ Taubman 2017, p. 9. ^ a b Medvedev 1986, p. 22. ^ a b Taubman 2017, p. 16. ^ Taubman 2017, pp. 16, 17. ^ Doder & Branson 1990, p. 1; Taubman 2017, p. 7. ^ McCauley 1998, p. 15; Taubman 2017, pp. 12–13. ^ Taubman 2017, p. 14. ^ McCauley 1998, p. 16; Taubman 2017, p. 7. ^ McCauley 1998, pp. 15–16; Taubman 2017, pp. 7, 8. ^ Taubman 2017, pp. 18–19. ^ Doder & Branson 1990, pp. 5–6; McCauley 1998, p. 17; Taubman 2017, pp. 7, 20–22. ^ Doder & Branson 1990, p. 5; McCauley 1998, p. 17; Taubman 2017, pp. 8, 26–27. ^ Taubman 2017, p. 27. ^ Taubman 2017, pp. 9, 27–28. ^ Taubman 2017, pp. 29–30. ^ Taubman 2017, pp. 8, 28–29. ^ Taubman 2017, p. 30. ^ Doder & Branson 1990, p. 7; McCauley 1998, p. 18; Taubman 2017, p. 32. ^ Taubman 2017, p. 32. ^ McCauley 1998, p. 18; Taubman 2017, p. 34. ^ Doder & Branson 1990, p. 6; McCauley 1998, p. 18; Taubman 2017, pp. 8, 34. ^ a b Taubman 2017, p. 42. ^ Doder & Branson 1990, p. 6, 8; McCauley 1998, p. 18; Taubman 2017, pp. 40–41. ^ Medvedev 1986, p. 35. ^ Taubman 2017, p. 43. ^ Taubman 2017, p. 50. ^ a b Taubman 2017, p. 44. ^ Doder & Branson 1990, p. 14; Taubman 2017, p. 48. ^ Taubman 2017, p. 53. ^ Taubman 2017, p. 52. ^ McCauley 1998, p. 19; Taubman 2017, pp. 45, 52. ^ Doder & Branson 1990, p. 10; McCauley 1998, p. 19; Taubman 2017, p. 46. ^ Taubman 2017, p. 46. ^ McCauley 1998, p. 19; Taubman 2017, p. 46. ^ Taubman 2017, p. 47. ^ Medvedev 1986, pp. 36–37; Doder & Branson 1990, p. 11; McCauley 1998, p. 19; Taubman 2017, pp. 45, 53, 56–57. ^ McCauley 1998, p. 20; Taubman 2017, pp. 57–58. ^ Doder & Branson 1990, p. 15; Taubman 2017, pp. 59, 63. ^ Taubman 2017, pp. 59–63. ^ Taubman 2017, p. 66. ^ Taubman 2017, pp. 72–73. ^ a b McCauley 1998, p. 20; Taubman 2017, p. 68. ^ Taubman 2017, p. 70. ^ Taubman 2017, pp. 70–71. ^ Medvedev 1986, p. 42; McCauley 1998, p. 20. ^ McCauley 1998, p. 20. ^ McCauley 1998, pp. 20–21; Taubman 2017, pp. 73–74. ^ McCauley 1998, p. 20; Taubman 2017, p. 74. ^ McCauley 1998, pp. 20–21; Taubman 2017, p. 75. ^ McCauley 1998, p. 21; Taubman 2017, p. 77. ^ Doder & Branson 1990, p. 31; Taubman 2017, p. 78. ^ Taubman 2017, p. 95. ^ McCauley 1998, p. 210; Taubman 2017, pp. 81–83. ^ Taubman 2017, p. 81. ^ Doder & Branson 1990, p. 19; McCauley 1998, p. 23; Taubman 2017, p. 86. ^ McCauley 1998, p. 23; Taubman 2017, p. 89. ^ Medvedev 1986, pp. 56, 62; Doder & Branson 1990, p. 19; McCauley 1998, p. 29; Taubman 2017, pp. 115–116. ^ Medvedev 1986, p. 63; Doder & Branson 1990, p. 19; McCauley 1998, p. 29; Taubman 2017, pp. 111–113. ^ Taubman 2017, p. 86. ^ Taubman 2017, pp. 90–91. ^ Taubman 2017, p. 90. ^ Taubman 2017, p. 91. ^ McCauley 1998, p. 22; Taubman 2017, pp. 96–98. ^ Taubman 2017, p. 78. ^ Taubman 2017, p. 80. ^ Medvedev 1986, p. 74; Doder & Branson 1990, p. 32; McCauley 1998, p. 25; Taubman 2017, pp. 105–106. ^ Taubman 2017, pp. 103, 105. ^ Medvedev 1986, p. 47; Doder & Branson 1990, p. 31; McCauley 1998, p. 23; Taubman 2017, p. 98. ^ McCauley 1998, p. 23; Taubman 2017, p. 100. ^ Taubman 2017, p. 89. ^ McCauley 1998, p. 23; Taubman 2017, p. 99. ^ Taubman 2017, p. 100. ^ Medvedev 1986, p. 49; McCauley 1998, p. 23. ^ a b c Taubman 2017, p. 102. ^ Taubman 2017, p. 149. ^ Medvedev 1986, p. 50; Doder & Branson 1990, p. 24; McCauley 1998, p. 24. ^ Taubman 2017, p. 107. ^ Medvedev 1986, p. 61; McCauley 1998, p. 26. ^ a b Taubman 2017, p. 116. ^ Medvedev 1986, p. 63; Doder & Branson 1990, p. 32; McCauley 1998, p. 28; Taubman 2017, p. 119. ^ Medvedev 1986, p. 64. ^ McCauley 1998, p. 30. ^ Taubman 2017, pp. 123–124. ^ Medvedev 1986, pp. 64–65; McCauley 1998, p. 30; Taubman 2017, p. 124. ^ McCauley 1998, pp. 28–29; Taubman 2017, p. 125. ^ Taubman 2017, pp. 125–126. ^ Medvedev 1986, p. 65; Doder & Branson 1990, p. 32; McCauley 1998, p. 29; Taubman 2017, p. 120. ^ Taubman 2017, pp. 121–122. ^ Taubman 2017, p. 121. ^ Medvedev 1986, p. 73; Taubman 2017, p. 121. ^ Medvedev 1986, p. 65. ^ a b Taubman 2017, p. 127. ^ Taubman 2017, p. 129. ^ McCauley 1998, pp. 31–32; Taubman 2017, p. 130. ^ McCauley 1998, p. 33; Taubman 2017, pp. 131–132. ^ Taubman 2017, p. 123. ^ Taubman 2017, pp. 128–129. ^ a b Taubman 2017, p. 157. ^ Doder & Branson 1990, pp. 35–36; Taubman 2017, pp. 138–139. ^ McCauley 1998, p. 35; Taubman 2017, pp. 145–146. ^ Medvedev 1986, pp. 108, 113; McCauley 1998, p. 35. ^ Medvedev 1986, p. 78; Taubman 2017, p. 149. ^ Taubman 2017, pp. 149–150. ^ McCauley 1998, p. 30; Taubman 2017, pp. 150–151. ^ Taubman 2017, pp. 151–152. ^ Taubman 2017, p. 152. ^ a b Taubman 2017, p. 153. ^ Taubman 2017, pp. 153–154. ^ Taubman 2017, p. 156. ^ Medvedev 1986, p. 77. ^ Medvedev 1986, p. 92; McCauley 1998, p. 36; Taubman 2017, p. 157. ^ Taubman 2017, p. 161. ^ Taubman 2017, pp. 164–175. ^ Taubman 2017, pp. 165, 166. ^ a b Taubman 2017, p. 165. ^ McCauley 1998, p. 40; Taubman 2017, p. 166. ^ Medvedev 1986, pp. 95–96; Doder & Branson 1990, pp. 38–39. ^ Medvedev 1986, pp. 7, 102–103, 106–107; Doder & Branson 1990, p. 40; Galeotti 1997, p. 32; Taubman 2017, pp. 175–177. ^ Medvedev 1986, p. 107; Doder & Branson 1990, p. 40. ^ Taubman 2017, pp. 177–78. ^ McCauley 1998, p. 34. ^ a b Taubman 2017, p. 173. ^ a b Medvedev 1986, p. 107. ^ Medvedev 1986, pp. 118, 121–122; Doder & Branson 1990, p. 43; McCauley 1998, p. 41; Taubman 2017, pp. 179–180. ^ Taubman 2017, p. 180. ^ Medvedev 1986, p. 123. ^ Taubman 2017, pp. 181, 191. ^ Galeotti 1997, p. 32; Taubman 2017, p. 181. ^ Medvedev 1986, p. 123; Galeotti 1997, p. 32; Taubman 2017, p. 181. ^ Taubman 2017, p. 182. ^ Medvedev 1986, p. 124; Doder & Branson 1990, pp. 46–47; McCauley 1998, p. 31; Taubman 2017, pp. 182–185. ^ Doder & Branson 1990, p. 47; McCauley 1998, p. 31; Taubman 2017, p. 182. ^ Doder & Branson 1990, p. 50; Taubman 2017, pp. 190–191. ^ Medvedev 1986, p. 138; Doder & Branson 1990, p. 56. ^ Medvedev 1986, pp. 138–139; Doder & Branson 1990, pp. 51–52; McCauley 1998, p. 43; Taubman 2017, p. 192. ^ Doder & Branson 1990, p. 57; McCauley 1998, p. 43; Taubman 2017, p. 193. ^ Taubman 2017, p. 193. ^ Medvedev 1986, pp. 158–159; Taubman 2017, pp. 193–195. ^ Medvedev 1986, p. 142; Taubman 2017, p. 196. ^ McCauley 1998, p. 44; Taubman 2017, p. 195. ^ Medvedev 1986, p. 155. ^ Medvedev 1986, p. 159; Doder & Branson 1990, p. 59; McCauley 1998, p. 44; Taubman 2017, p. 196. ^ Medvedev 1986, p. 159; McCauley 1998, p. 44; Taubman 2017, p. 201. ^ Taubman 2017, p. 197. ^ Medvedev 1986, p. 4; Doder & Branson 1990, p. 62; McCauley 1998, p. 45; Taubman 2017, p. 204. ^ Doder & Branson 1990, pp. 63–64; McCauley 1998, p. 45. ^ Taubman 2017, pp. 205–206. ^ Medvedev 1986, p. 16; McCauley 1998, p. 46; Taubman 2017, pp. 211–212. ^ Doder & Branson 1990, p. 69. ^ Doder & Branson 1990, p. 65. ^ Doder & Branson 1990, p. 66. ^ Doder & Branson 1990, p. 87; McCauley 1998, p. 59; Taubman 2017, p. 213. ^ Medvedev 1986, pp. 194–195; Doder & Branson 1990, p. 101; McCauley 1998, p. 60; Taubman 2017, p. 237. ^ Taubman 2017, p. 228. ^ Doder & Branson 1990, p. 76. ^ Doder & Branson 1990, p. 20; Taubman 2017, pp. 224–226. ^ McCauley 1998, p. 54; Taubman 2017, p. 223. ^ McCauley 1998, pp. 52, 55. ^ Doder & Branson 1990, p. 100; Taubman 2017, pp. 219–220. ^ Medvedev 1986, p. 177; Doder & Branson 1990, p. 95; McCauley 1998, p. 52; Taubman 2017, p. 220. ^ Doder & Branson 1990, p. 97; Taubman 2017, p. 221. ^ Medvedev 1986, p. 177; McCauley 1998, p. 53; Taubman 2017, p. 222. ^ a b Doder & Branson 1990, p. 94. ^ McCauley 1998, p. 54. ^ McCauley 1998, p. 52. ^ McCauley 1998, p. 50. ^ McCauley 1998, p. 55. ^ Doder & Branson 1990, p. 81. ^ Doder & Branson 1990, p. 82. ^ McCauley 1998, pp. 51, 55; Taubman 2017, p. 235. ^ McCauley 1998, pp. 50–51. ^ Taubman 2017, p. 236. ^ McCauley 1998, p. 56. ^ Taubman 2017, pp. 236–237. ^ Bialer, Seweryn, and Joan Afferica. "The Genesis of Gorbachev's World", Foreign Affairs 64, no. 3 (1985): 605–644. ^ McCauley 1998, pp. 56, 57. ^ McCauley 1998, p. 57. ^ McCauley 1998, pp. 61–62. ^ Doder & Branson 1990, p. 167; McCauley 1998, p. 58. ^ Chiesa, Giulietto (1991). Time of Change: An Insider's View of Russia's Transformation. I.B.Tauris. p. 30. ISBN 978-1-85043-305-7. ^ Hosking, Geoffrey Alan (1991). The Awakening of the Soviet Union. Harvard University Press. p. 139. ISBN 978-0-674-05551-3. ^ a b Doder & Branson 1990, p. 166. ^ Tarschys 1993, p. 16; Bhattacharya, Gathmann & Miller 2013, p. 236. ^ Taubman 2017, pp. 232, 234. ^ Medvedev 1986, pp. 187–188; Doder & Branson 1990, p. 86; Bhattacharya, Gathmann & Miller 2013, p. 236. ^ Tarschys 1993, p. 19; Bhattacharya, Gathmann & Miller 2013, p. 236. ^ Taubman 2017, p. 232. ^ Medvedev 1986, p. 188; Tarschys 1993, p. 20. ^ McCauley 1998, p. 62; Taubman 2017, p. 233. ^ Taubman 2017, p. 233. ^ Tarschys 1993, p. 22; Bhattacharya, Gathmann & Miller 2013, p. 238. ^ Bhattacharya, Gathmann & Miller 2013, pp. 233, 238. ^ Doder & Branson 1990, p. 120. ^ Doder & Branson 1990, pp. 75, 140, 142. ^ Doder & Branson 1990, pp. 142–143. ^ Doder & Branson 1990, p. 93. ^ Doder & Branson 1990, p. 172; Taubman 2017, pp. 250–251. ^ Doder & Branson 1990, p. 143. ^ Doder & Branson 1990, p. 148. ^ Taubman 2017, p. 251. ^ Doder & Branson 1990, pp. 146–147. ^ a b Taubman 2017, p. 322. ^ a b Taubman 2017, p. 324. ^ McCauley 1998, p. 71; Taubman 2017, pp. 323, 326–328. ^ a b Taubman 2017, p. 329. ^ Taubman 2017, p. 330. ^ Doder & Branson 1990, p. 129; Taubman 2017, p. 240. ^ Taubman 2017, p. 240. ^ a b Taubman 2017, p. 241. ^ Doder & Branson 1990, p. 134. ^ Doder & Branson 1990, p. 137. ^ Taubman 2017, pp. 242–243. ^ Taubman 2017, p. 266. ^ a b c d Taubman 2017, p. 271. ^ a b c Taubman 2017, p. 272. ^ Taubman 2017, pp. 272–273. ^ a b Taubman 2017, p. 263. ^ Taubman 2017, p. 275. ^ Taubman 2017, p. 278. ^ Doder & Branson 1990, p. 109; Taubman 2017, p. 278. ^ Medvedev 1986, pp. 237–238; McCauley 1998, p. 142; Taubman 2017, pp. 278–279. ^ Taubman 2017, p. 285. ^ a b Taubman 2017, p. 286. ^ Taubman 2017, pp. 289–291. ^ Doder & Branson 1990, p. 114. ^ Taubman 2017, p. 484. ^ McCauley 1998, p. 80; Taubman 2017, p. 291. ^ Doder & Branson 1990, pp. 159–162; McCauley 1998, p. 81; Taubman 2017, p. 294. ^ McCauley 1998, pp. 80–81; Taubman 2017, pp. 297–301. ^ a b Taubman 2017, p. 304. ^ Taubman 2017, p. 267. ^ Doder & Branson 1990, pp. 154–155. ^ Doder & Branson 1990, p. 222. ^ Doder & Branson 1990, pp. 191–192; Taubman 2017, pp. 307, 309. ^ Taubman 2017, p. 308. ^ Taubman 2017, p. 310. ^ Taubman 2017, p. 311. ^ Taubman 2017, p. 312. ^ Doder & Branson 1990, p. 239; Taubman 2017, p. 313. ^ McCauley 1998, p. 115; Taubman 2017, pp. 434–435, 449–450. ^ McCauley 1998, p. 116; Taubman 2017, p. 450. ^ a b Taubman 2017, p. 314. ^ Taubman 2017, pp. 338–339. ^ Taubman 2017, p. 317. ^ Taubman 2017, p. 315. ^ Doder & Branson 1990, p. 151; Taubman 2017, p. 341. ^ McCauley 1998, p. 131. ^ Doder & Branson 1990, p. 217; Taubman 2017, p. 397. ^ Doder & Branson 1990, p. 74; Taubman 2017, p. 340. ^ Doder & Branson 1990, p. 290; Taubman 2017, p. 340. ^ Doder & Branson 1990, pp. 186–187. ^ Doder & Branson 1990, p. 195. ^ Doder & Branson 1990, p. 246; Taubman 2017, p. 319. ^ Doder & Branson 1990, p. 281; McCauley 1998, p. 92; Taubman 2017, pp. 320–321. ^ Doder & Branson 1990, p. 282; Taubman 2017, p. 321. ^ Doder & Branson 1990, pp. 305–306; McCauley 1998, pp. 93–94; Taubman 2017, p. 342. ^ Taubman 2017, pp. 345–346. ^ McCauley 1998, p. 94; Taubman 2017, pp. 346–349. ^ Taubman 2017, pp. 349–350. ^ Doder & Branson 1990, pp. 192–193; McCauley 1998, pp. 94–95; Taubman 2017, p. 351. ^ Taubman 2017, p. 353. ^ McCauley 1998, p. 105; Taubman 2017, pp. 353–354. ^ Taubman 2017, p. 354. ^ Taubman 2017, p. 352. ^ Taubman 2017, p. 359. ^ McCauley 1998, p. 100; Taubman 2017, p. 371. ^ McCauley 1998, pp. 104–105; Taubman 2017, pp. 428–429. ^ McCauley 1998, pp. 104–105; Taubman 2017, pp. 429–430. ^ McCauley 1998, p. 107; Taubman 2017, p. 444. ^ McCauley 1998, pp. 106–107; Taubman 2017, pp. 431–432. ^ Taubman 2017, p. 433. ^ Taubman 2017, p. 434. ^ a b McCauley 1998, p. 108; Taubman 2017, p. 442. ^ McCauley 1998, p. 109; Taubman 2017, p. 444. ^ Taubman 2017, pp. 445–448. ^ Taubman 2017, pp. 456–457. ^ Taubman 2017, p. 387. ^ Taubman 2017, pp. 386–387. ^ Doder & Branson 1990, p. 231; McCauley 1998, pp. 83, 142; Taubman 2017, p. 387. ^ Doder & Branson 1990, pp. 217, 220; McCauley 1998, p. 84, 143; Taubman 2017, pp. 390–392. ^ McCauley 1998, p. 143; Taubman 2017, pp. 475–476. ^ Taubman 2017, pp. 387–388. ^ McCauley 1998, p. 43; Taubman 2017, pp. 388–389. ^ Taubman 2017, pp. 476–478. ^ McCauley 1998, p. 144. ^ Taubman 2017, p. 392. ^ Taubman 2017, pp. 478–479. ^ Taubman 2017, pp. 479–480. ^ Doder & Branson 1990, pp. 208–209. ^ Doder & Branson 1990, p. 215. ^ Taubman 2017, pp. 393–394. ^ Taubman 2017, pp. 394–396. ^ Doder & Branson 1990, pp. 234–237; Taubman 2017, pp. 396–397. ^ McCauley 1998, p. 138; Taubman 2017, pp. 401–403. ^ Taubman 2017, p. 401. ^ Taubman 2017, pp. 411, 413. ^ Taubman 2017, p. 414. ^ Taubman 2017, p. 415. ^ Taubman 2017, pp. 416–417. ^ Taubman 2017, p. 419. ^ McCauley 1998, p. 139; Taubman 2017, pp. 421–422. ^ McCauley 1998, p. 139; Taubman 2017, pp. 422–426. ^ Taubman 2017, pp. 467–470. ^ McCauley 1998, pp. 140–141; Taubman 2017, pp. 494–496. ^ Taubman 2017, pp. 496–497. ^ Taubman 2017, p. 498. ^ McCauley 1998, p. 142. ^ McCauley 1998, pp. 74–75. ^ Doder & Branson 1990, p. 268; McCauley 1998, p. 76; Taubman 2017, p. 367. ^ Doder & Branson 1990, p. 302; Taubman 2017, p. 386. ^ Doder & Branson 1990, pp. 267–268, 299–300; McCauley 1998, p. 119; Taubman 2017, p. 368. ^ Taubman 2017, p. 368. ^ Doder & Branson 1990, p. 301; Taubman 2017, p. 369. ^ Doder & Branson 1990, p. 301; McCauley 1998, p. 119; Taubman 2017, pp. 369–370. ^ Taubman 2017, p. 370. ^ McCauley 1998, p. 159; Taubman 2017, pp. 504–505. ^ McCauley 1998, p. 130; Taubman 2017, pp. 436–437. ^ McCauley 1998, pp. 126–127; Taubman 2017, p. 435. ^ McCauley 1998, p. 128; Taubman 2017, p. 452. ^ McCauley 1998, p. 128. ^ McCauley 1998, pp. 157–158; Taubman 2017, p. 503. ^ Doder & Branson 1990, p. 212; McCauley 1998, p. 32. ^ Taubman 2017, p. 386. ^ Taubman 2017, p. 379. ^ Taubman 2017, pp. 381, 382, 383. ^ Doder & Branson 1990, p. 230. ^ Taubman 2017, pp. 384–385. ^ Doder & Branson 1990, p. 230; Taubman 2017, p. 385. ^ a b Taubman 2017, p. 465. ^ Taubman 2017, pp. 465–466. ^ McCauley 1998, p. 133; Taubman 2017, p. 481. ^ McCauley 1998, pp. 35–36; Taubman 2017, pp. 484–485. ^ Taubman 2017, pp. 462–463. ^ Taubman 2017, pp. 488–494. ^ Taubman 2017, p. 427. ^ Taubman 2017, p. 505. ^ Taubman 2017, pp. 505–506. ^ Taubman 2017, pp. 506–507. ^ McCauley 1998, pp. 160–161; Taubman 2017, p. 507. ^ McCauley 1998, p. 165; Taubman 2017, pp. 508–509. ^ a b Taubman 2017, p. 509. ^ McCauley 1998, pp. 164–165; Taubman 2017, p. 509. ^ McCauley 1998, pp. 165–166; Taubman 2017, p. 511. ^ McCauley 1998, p. 161; Taubman 2017, pp. 510–522. ^ McCauley 1998, p. 170; Taubman 2017, p. 513. ^ McCauley 1998, p. 169; Taubman 2017, pp. 513–514. ^ a b Taubman 2017, p. 515. ^ McCauley 1998, p. 172. ^ McCauley 1998, pp. 174–175; Taubman 2017, pp. 500–501, 515–516. ^ Taubman 2017, p. 543. ^ a b Taubman 2017, p. 552. ^ Taubman 2017, p. 550. ^ Taubman 2017, p. 546. ^ Taubman 2017, p. 547. ^ Taubman 2017, p. 558. ^ Taubman 2017, p. 564. ^ Taubman 2017, p. 565. ^ Taubman 2017, pp. 540–541. ^ McCauley 1998, p. 213; Taubman 2017, pp. 540–541, 566–567. ^ Taubman 2017, pp. 567–568. ^ Taubman 2017, p. 568. ^ Taubman 2017, pp. 588–589. ^ McCauley 1998, p. 220; Taubman 2017, p. 572. ^ Taubman 2017, p. 572. ^ McCauley 1998, p. 214. ^ Taubman 2017, pp. 568–569. ^ McCauley 1998, pp. 218–219; Taubman 2017, p. 593. ^ Taubman 2017, p. 570. ^ McCauley 1998, p. 215; Taubman 2017, pp. 595–596. ^ McCauley 1998, pp. 218–219; Taubman 2017, p. 595. ^ McCauley 1998, p. 214; Taubman 2017, p. 595. ^ Taubman 2017, p. 569. ^ McCauley 1998, p. 221; Taubman 2017, pp. 596–598. ^ McCauley 1998, p. 178; Taubman 2017, pp. 519–520. ^ McCauley 1998, pp. 183–185; Taubman 2017, pp. 521–524. ^ Taubman 2017, pp. 525, 528. ^ McCauley 1998, pp. 185–186; Taubman 2017, p. 529. ^ Taubman 2017, p. 530. ^ Taubman 2017, p. 529. ^ Taubman 2017, pp. 530–531. ^ Taubman 2017, p. 532. ^ Taubman 2017, p. 533. ^ McCauley 1998, p. 188; Taubman 2017, p. 533. ^ Taubman 2017, p. 536. ^ McCauley 1998, pp. 193–194; Taubman 2017, pp. 534–535. ^ Taubman 2017, p. 531. ^ Taubman 2017, p. 539. ^ Taubman 2017, p. 575. ^ McCauley 1998, pp. 199–200; Taubman 2017, p. 575. ^ Taubman 2017, pp. 575–576. ^ Taubman 2017, pp. 576–577. ^ McCauley 1998, p. 208; Taubman 2017, pp. 577–578. ^ McCauley 1998, pp. 209–210; Taubman 2017, p. 579. ^ McCauley 1998, pp. 206–207; Taubman 2017, p. 580. ^ Taubman 2017, pp. 580–582. ^ McCauley 1998, p. 233; Taubman 2017, pp. 602, 605. ^ Taubman 2017, pp. 607–608. ^ McCauley 1998, p. 235; Taubman 2017, pp. 607–608. ^ Taubman 2017, p. 608. ^ Taubman 2017, pp. 608–610. ^ McCauley 1998, p. 237; Taubman 2017, p. 610. ^ McCauley 1998, pp. 237–238; Taubman 2017, p. 611. ^ a b Taubman 2017, p. 612. ^ Taubman 2017, pp. 614–615. ^ Taubman 2017, p. 621. ^ McCauley 1998, p. 244; Taubman 2017, p. 621. ^ McCauley 1998, p. 239; Taubman 2017, p. 621. ^ McCauley 1998, p. 244; Taubman 2017, p. 622. ^ McCauley 1998, pp. 248–249; Taubman 2017, pp. 631–632. ^ McCauley 1998, p. 249; Taubman 2017, p. 633. ^ Taubman 2017, p. 624. ^ McCauley 1998, p. 252; Taubman 2017, p. 627. ^ Taubman 2017, p. 628. ^ McCauley 1998, p. 253; Taubman 2017, pp. 628–629. ^ McCauley 1998, pp. 254–255; Taubman 2017, pp. 629–630. ^ McCauley 1998, p. 255; Taubman 2017, p. 630. ^ Taubman 2017, pp. 634–635. ^ McCauley 1998, p. 256; Taubman 2017, p. 625. ^ Taubman 2017, p. 636. ^ a b Taubman 2017, p. 637. ^ a b Taubman 2017, p. 638. ^ McCauley 1998, p. 257; Taubman 2017, p. 645. ^ Taubman 2017, p. 646. ^ Taubman 2017, p. 651. ^ McCauley 1998, p. 258. ^ a b Taubman 2017, p. 653. ^ McCauley 1998, p. 258; Taubman 2017, pp. 651, 654. ^ a b c Taubman 2017, p. 654. ^ a b c Taubman 2017, p. 652. ^ a b Taubman 2017, p. 656. ^ Taubman 2017, pp. 656–657. ^ Taubman 2017, p. 657. ^ Taubman 2017, pp. 654–655. ^ McCauley 1998, pp. 258–259; Taubman 2017, p. 664. ^ a b Taubman 2017, p. 675. ^ a b Taubman 2017, p. 655. ^ Taubman 2017, p. 658. ^ a b Taubman 2017, p. 659. ^ Taubman 2017, pp. 652–653. ^ Taubman 2017, p. 660. ^ Taubman 2017, pp. 660–661. ^ a b Taubman 2017, p. 661. ^ Taubman 2017, p. 662. ^ a b Taubman 2017, p. 663. ^ Taubman 2017, pp. 663–664. ^ Taubman 2017, pp. 664–665. ^ Taubman 2017, pp. 658–659. ^ Taubman 2017, p. 665. ^ Taubman 2017, pp. 666–667. ^ Taubman 2017, p. 668. ^ Taubman 2017, p. 674. ^ a b Taubman 2017, p. 676. ^ a b Taubman 2017, p. 677. ^ a b Taubman 2017, p. 679. ^ a b c d e Taubman 2017, p. 678. ^ "Russia Bans Party Founded by Gorbachev - NEWS - MOSNEWS.COM". web.archive.org. 23 April 2007. Archived from the original on 23 April 2007. ^ Cite error: The named reference Gorbachev sets up Russia movement was invoked but never defined (see the help page). ^ a b Taubman 2017, p. 680. ^ a b c d e Taubman 2017, p. 685. ^ Taubman 2017, pp. 685–686. ^ Blomfield, Adrian; Smith, Mike (6 May 2008). "Gorbachev: US could start new Cold War". The Telegraph. London. Retrieved 11 March 2015. ^ "Reagan funeral guest list". BBC News. 10 June 2004. Retrieved 30 January 2019. ^ Pitney, Nico. "Gorbachev Vows Revolution If New Orleans Levees Don't Improve". Huffington Post. Retrieved 14 September 2007. ^ Gray, Sadie (30 September 2008). "Gorbachev launches political party with Russian billionaire". The Guardian. UK. Retrieved 1 October 2008. ^ "Mikhail Gorbachev will found new political party". mosnews.com. 13 May 2009. Archived from the original on 16 July 2011. Retrieved 13 June 2009. ^ Gorbachev, Mikhail (12 August 2008). "A Path to Peace in the Caucasus". The Washington Post. Retrieved 12 August 2008. ^ Gorbachev, Mikhail, "Russia Never Wanted a War", New York Times, 19 August 2008, Retrieved on 2011-12-09. ^ a b c d Taubman 2017, p. 681. ^ "UPDATE 1-Russian police block new anti-Putin rally", Reuters (5 December 2011). Retrieved 9 December 2011. ^ Odynova, Alexandra (19 June 2009). "Former Soviet Leader Gorbachev Records Album". Saint Petersburg Times. Retrieved 20 June 2009. ^ "Obama met Gorbachev in run-up to Medvedev talks". Reuters. 23 March 2009. Retrieved 30 January 2019. ^ Taubman 2017, pp. 682–683. ^ a b Taubman 2017, p. 684. ^ "Mikhail Gorbachev says Putin should not run for Russian presidency again", Christian Science Monitor (2 March 2011). Retrieved 9 December 2011. ^ "Gorbachev says Putin 'castrated' democracy in Russia". BBC News. 18 August 2011. Retrieved 18 August 2011. ^ "Gorbachev takes aim at Putin, praises protesters". 13 April 2013. Retrieved 7 May 2013. ^ Taubman 2017, pp. 681–682. ^ "Mikhail Gorbachev hails Crimea annexation to Russia". United Press International. 18 March 2014. Retrieved 8 November 2014. ^ "Former Soviet leader Gorbachev warns against "new Cold War" in Ukraine crisis". Deutsche Welle. 16 October 2014. Retrieved 8 November 2014. ^ "Gorbachev throws shade at Putin: 'Russia can succeed only through democracy'". Politico. 20 April 2017. ^ Buchanan, Rose Troup (9 November 2014). "Mikhail Gorbachev warns global powers have put the world 'on the brink of a new Cold War'". The Independent. UK. Retrieved 9 May 2016. ^ Johnston, Chris (9 November 2014). "Mikhail Gorbachev: world on brink of new cold war over Ukraine". The Guardian. Retrieved 9 May 2016. ^ "Besuch zum Mauerfall-Jubiläum: Gorbatschow lobt Deutschland". Faz.net. 7 November 2014 – via FAZ.NET. ^ "Mikhail Gorbachev says Nato is escalating Cold War with Russia 'into a hot one'". The Independent. 9 July 2016. ^ "The Latest: Gorbachev has high hopes for Putin-Trump summit". Associated Press. 28 June 2018. ^ "Gorbachev says Trump's nuclear treaty withdrawal 'not the work of a great mind'". CNBC. 22 October 2018. ^ "Mikhail Gorbachev | Club de Madrid". Clubmadrid.org. Archived from the original on 15 August 2013. Retrieved 19 November 2012. ^ a b c d Taubman 2017, p. 215. ^ Doder & Branson 1990, p. 11. ^ Doder & Branson 1990, p. 13. ^ Doder & Branson 1990, p. 12. ^ Doder & Branson 1990, p. 25. ^ a b c Doder & Branson 1990, p. 22. ^ Doder & Branson 1990, p. 116. ^ Medvedev 1986, p. 245. ^ Doder & Branson 1990, pp. 116–117. ^ Doder & Branson 1990, p. 117. ^ Doder & Branson 1990, p. 250. ^ Doder & Branson 1990, p. 288. ^ Doder & Branson 1990, p. 9. ^ McCauley 1998, pp. 262–263. ^ a b McCauley 1998, p. 264. ^ McCauley 1998, p. 265. ^ a b Taubman 2017, p. 690. ^ a b Taubman 2017, p. 218. ^ McCauley 1998, p. 220. ^ McCauley 1998, p. 259. ^ Taubman 2017, p. 216. ^ Medvedev 1986, p. 160. ^ Doder & Branson 1990, p. 22; McCauley 1998, pp. 23, 273; Taubman 2017, pp. 5, 689. ^ a b c Taubman 2017, p. 142. ^ Doder & Branson 1990, p. 38; Taubman 2017, p. 8. ^ a b Doder & Branson 1990, p. 32. ^ a b c Taubman 2017, p. 1. ^ Medvedev 1986, p. 37; Doder & Branson 1990, p. 13. ^ McCauley 1998, p. 51. ^ Medvedev 1986, p. 43. ^ Medvedev 1986, p. 165. ^ Doder & Branson 1990, p. 287. ^ McCauley 1998, pp. 268–269. ^ Doder & Branson 1990, p. 16. ^ Doder & Branson 1990, p. 150. ^ Taubman 2017, pp. 114–115. ^ Doder & Branson 1990, p. 17. ^ Taubman 2017, p. 137. ^ Taubman 2017, p. 163. ^ Taubman 2017, pp. 136–137. ^ a b Taubman 2017, p. 4. ^ a b c Taubman 2017, p. 134. ^ a b McCauley 1998, p. 161. ^ Taubman 2017, pp. 134, 135. ^ Taubman 2017, p. 117. ^ McCauley 1998, p. 273. ^ McCauley 1998, p. 270; Taubman 2017, p. 229. ^ Taubman 2017, p. 229. ^ Doder & Branson 1990, p. 14. ^ Taubman 2017, p. 516. ^ Taubman 2017, p. 541. ^ a b Doder & Branson 1990, p. 50. ^ Doder & Branson 1990, p. 50; Taubman 2017, p. 7. ^ Taubman 2017, p. 77. ^ Doder & Branson 1990, p. 32; Taubman 2017, p. 121. ^ Taubman 2017, p. 179. ^ Doder & Branson 1990, p. 50; Taubman 2017, p. 44. ^ Taubman 2017, p. 94. ^ McCauley 1998, p. 18. ^ Taubman 2017, pp. 4–5. ^ Taubman 2017, p. 155. ^ Doder & Branson 1990, p. 290. ^ Westbrook, Ray (1 April 2013). "Otis Gatewood helped rebuild Germany with God's word, supplies". Lubbock Avalanche-Journal. Lubbock, Texas. pp. A1, A5. Archived from the original on 14 March 2016. Retrieved 8 March 2018. ^ Moore, Malcolm (19 March 2008). "Mikhail Gorbachev admits he is a Christian". The Daily Telegraph. London. Retrieved 14 September 2018. ^ "Gorbachev a closet Christian?". Chicago Tribune. 23 March 2008. Archived from the original on 11 May 2008. ^ Taubman 2017, pp. 1, 539. ^ Doder & Branson 1990, p. 286; McCauley 1998, p. 138. ^ McCauley 1998, p. 267. ^ a b c d Taubman 2017, p. 688. ^ McCauley 1998, p. 197. ^ Taubman 2017, p. 687. ^ McCauley 1998, p. 275. ^ McCauley 1998, pp. 278–279. ^ McCauley 1998, p. 276. ^ Taubman 2017, p. 268. ^ Taubman 2017, p. 691. ^ Galeotti 1997, p. 35. ^ McCauley 1998, pp. 257–258. ^ "The Nobel Peace Prize 1990". Nobelprize.org. 15 October 1990. Retrieved 3 November 2010. ^ "National Churchill Museum | Mikhail Gorbachev Lecture at the National Churchill Museum". Churchillmemorial.org. 6 May 1992. Retrieved 19 November 2012. ^ Wark, Andrew (18 September 2000). "Mikhail Gorbachev to present U of C public lecture" (Press release). University of Calgary. Retrieved 10 September 2013. ^ "1994– Mikhail Gorbachev". Archived from the original on 13 October 2011. ^ Honorary Degrees. Durham University. ^ "Minutes of the Council Meeting". Durham University. Archived from the original on 19 November 2011. Retrieved 8 September 2011. ^ "CIDADÃOS ESTRANGEIROS AGRACIADOS COM ORDENS PORTUGUESAS – Página Oficial das Ordens Honoríficas Portuguesas". www.ordens.presidencia.pt (in Portuguese). Retrieved 7 August 2017. ^ "The Peace Abbey Courage of Conscience Recipients List". Peaceabbey.org. 20 November 2005. Archived from the original on 16 February 2008. Retrieved 3 November 2010. ^ "Golden Plate Awardees of the American Academy of Achievement". www.achievement.org. American Academy of Achievement. ^ "Previous Recipients of Keys to the City". www.dublincity.ie. Dublin City Council. Retrieved 14 December 2017. ^ "Trinity College Honours Mikhail Gorbachev". Tcd.ie. Retrieved 3 November 2010. ^ "Mikhail Gorbachev". European Academy of Yuste Foundation. Retrieved 16 September 2017. ^ "Prokofiev Peter and the Wolf – Beintus Wolf Tracks". pentatonemusic. Retrieved 18 December 2016. ^ "Reunification Politicians Accept Prize". Deutsche Welle. Retrieved 22 May 2006. ^ "Université de Liège – Mikhail Gorbachev, a ULg Honorary Doctorate". ULg. Archived from the original on 29 October 2014. Retrieved 29 October 2014. ^ "Gorbachev pens new book urging West to end attempts to isolate Russia". TASS. 13 September 2018. Retrieved 13 September 2018. Bhattacharya, Jay; Gathmann, Christina; Miller, Grant (2013). "The Gorbachev Anti-Alcohol Campaign and Russia's Mortality Crisis". American Economic Journal: Applied Economics. 5 (2). pp. 232–260. JSTOR 43189436. Doder, Dusko; Branson, Louise (1990). Gorbachev: Heretic in the Kremlin. London: Futura. ISBN 978-0708849408. Galeotti, Mark (1997). Gorbachev and his Revolution. London: Palgrave. ISBN 978-0333638552. Tarschys, Daniel (1993). "The Success of a Failure: Gorbachev's Alcohol Policy, 1985-88". Europe-Asia Studies. 45 (1). pp. 7–25. JSTOR 153247. Taubman, William (2017). Gorbachev: His Life and Times. New York City: Simon and Schuster. ISBN 978-1471147968. McCauley, Martin (1998). Gorbachev. Profiles in Power. London and New York: Longman. ISBN 978-0582215979. Medvedev, Zhores (1986). Gorbachev. Oxford: Basil Blackwell. Wikimedia Commons has media related to Mikhail Gorbachev. "Mikhail Gorbachev collected news and commentary". The Guardian. "Mikhail Gorbachev collected news and commentary". The New York Times.